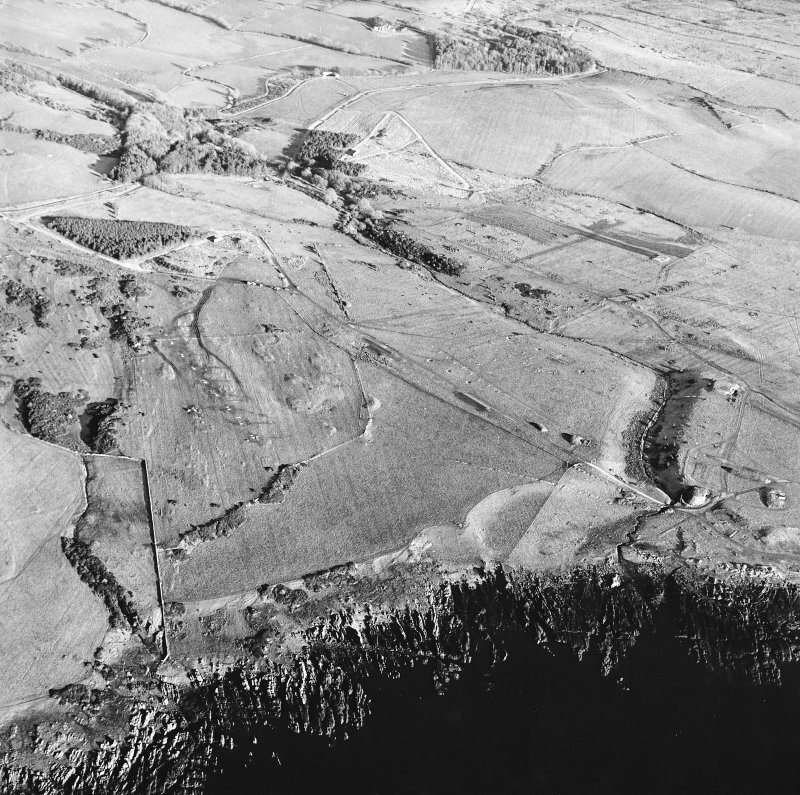 Oblique aerial view of Mullock centred on the remains of the farmstead and field-system, taken from the SSW. 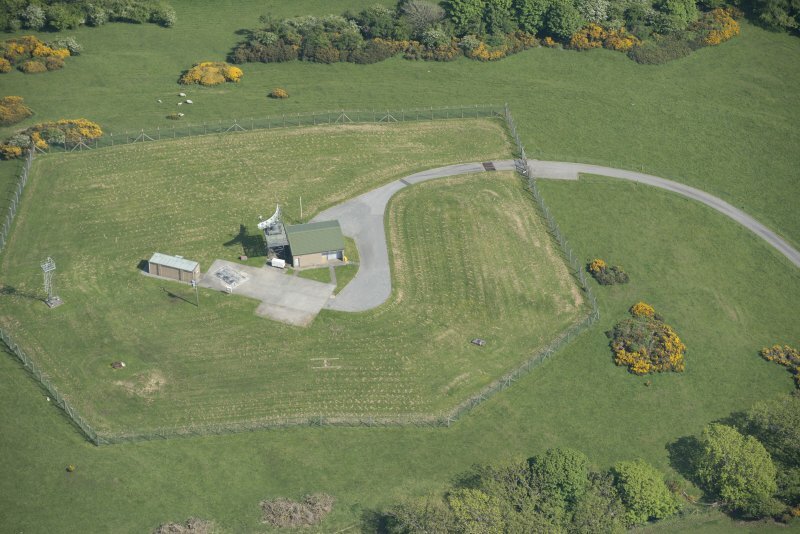 Oblique aerial view centred on the remains of rig with observation bunker adjacent, taken from the SSW. 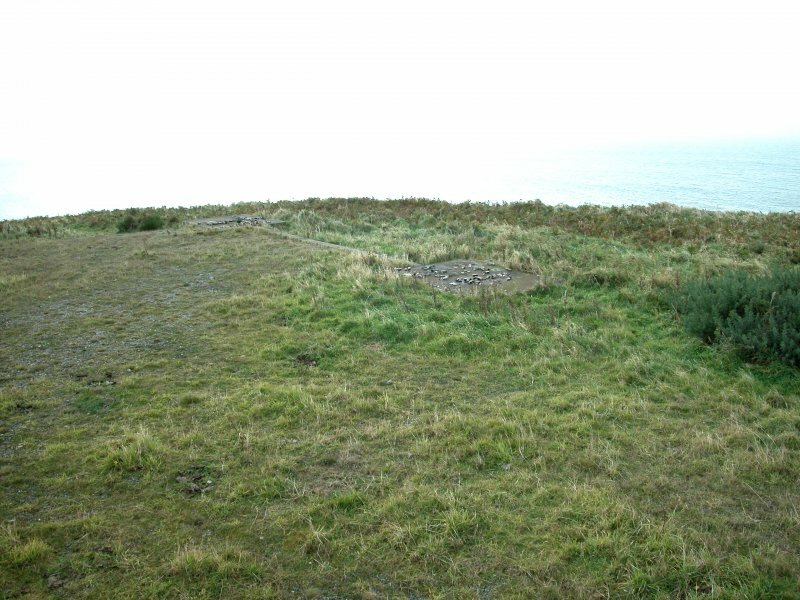 Oblique aerial view centred on the remains of the fort and tank firing platform, taken from the S.
Oblique aerial view centred on the remains of the fort and tank firing platform, taken from the ESE. 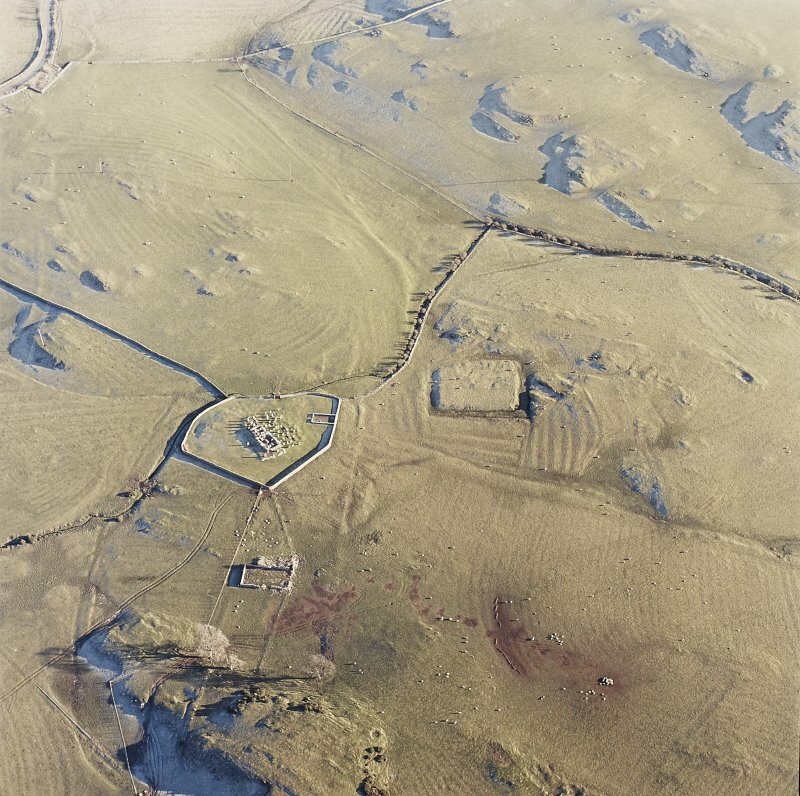 Oblique aerial view centred on the remains of the fort, taken from the WSW. 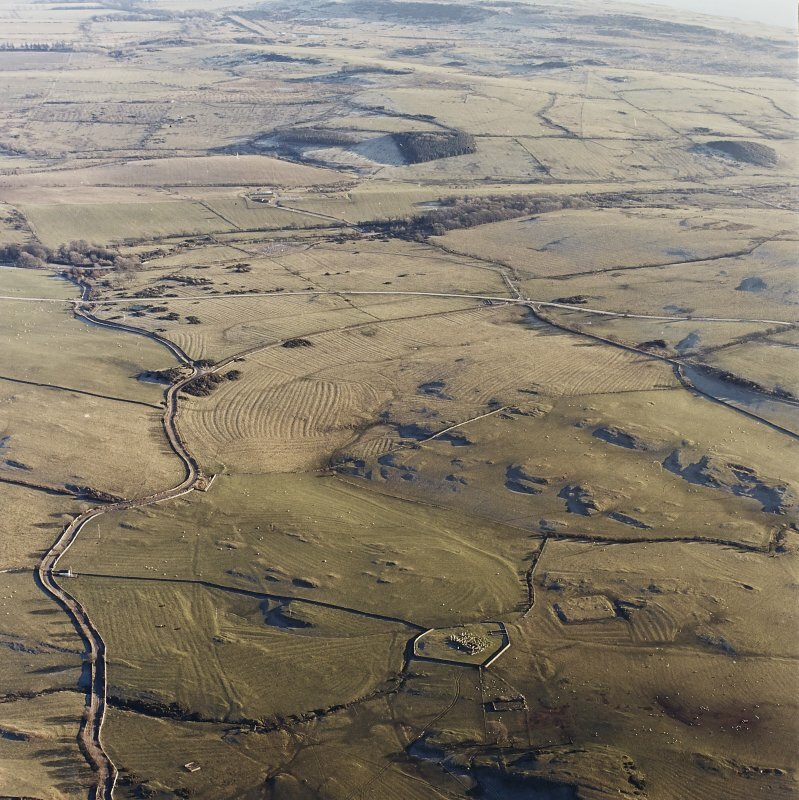 Oblique aerial view centred on the remains of field banks and rig with the homestead adjacent, taken from the W.
Oblique aerial view centred on the remains of the homestead with field banks and rig adjacent, taken from the SSW. 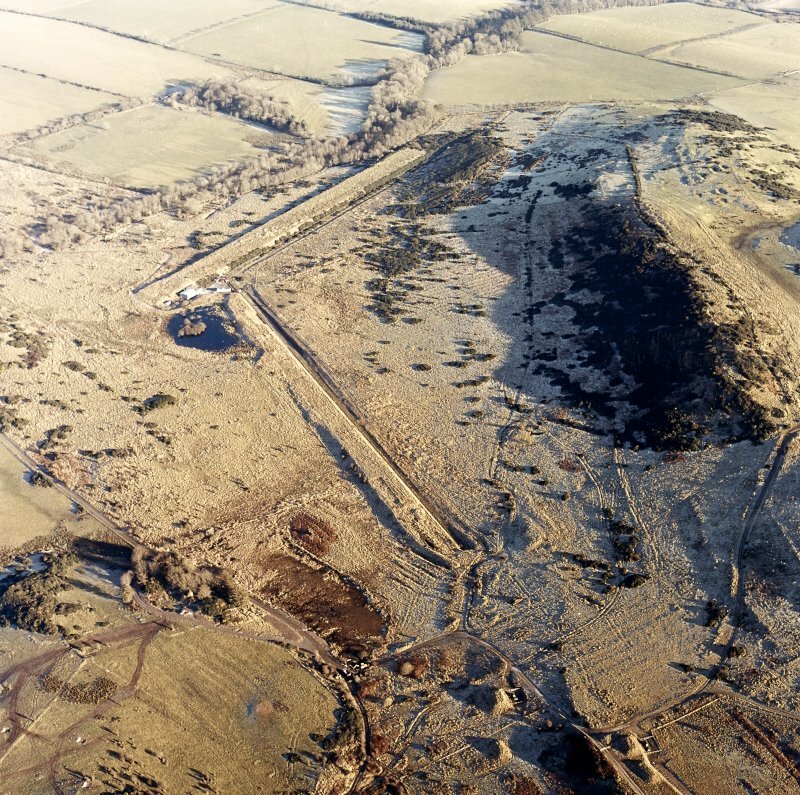 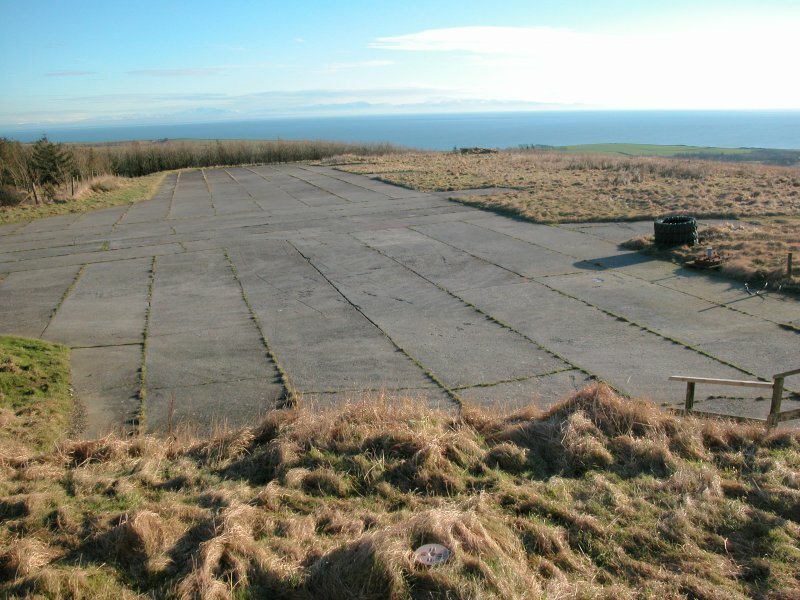 Oblique aerial view centred on the remains of rig, taken from the ENE. 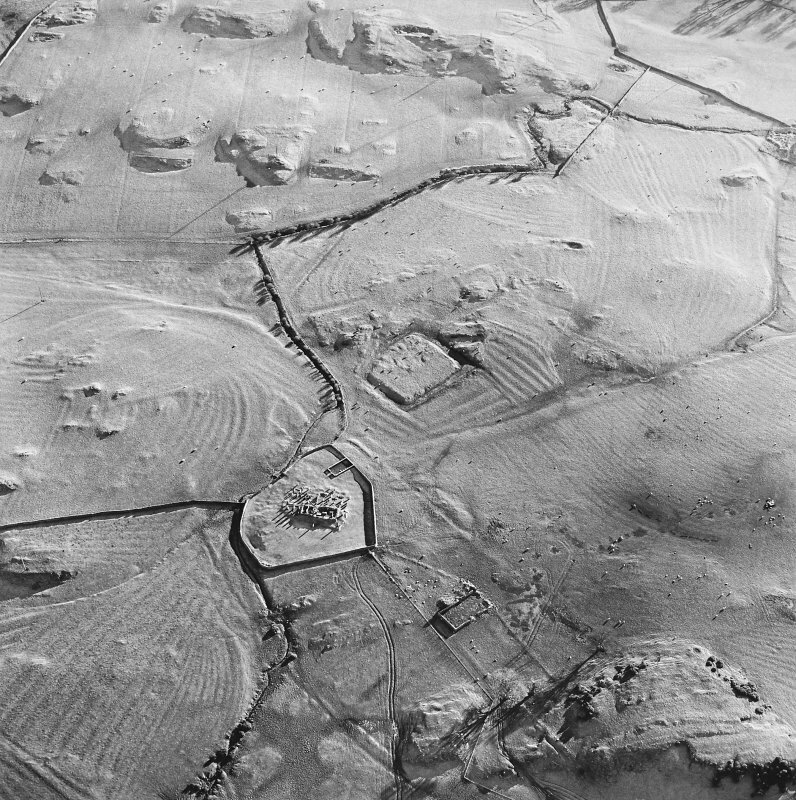 Oblique aerial view of Craigraploch centred on tracked target and rig, taken from the NE. 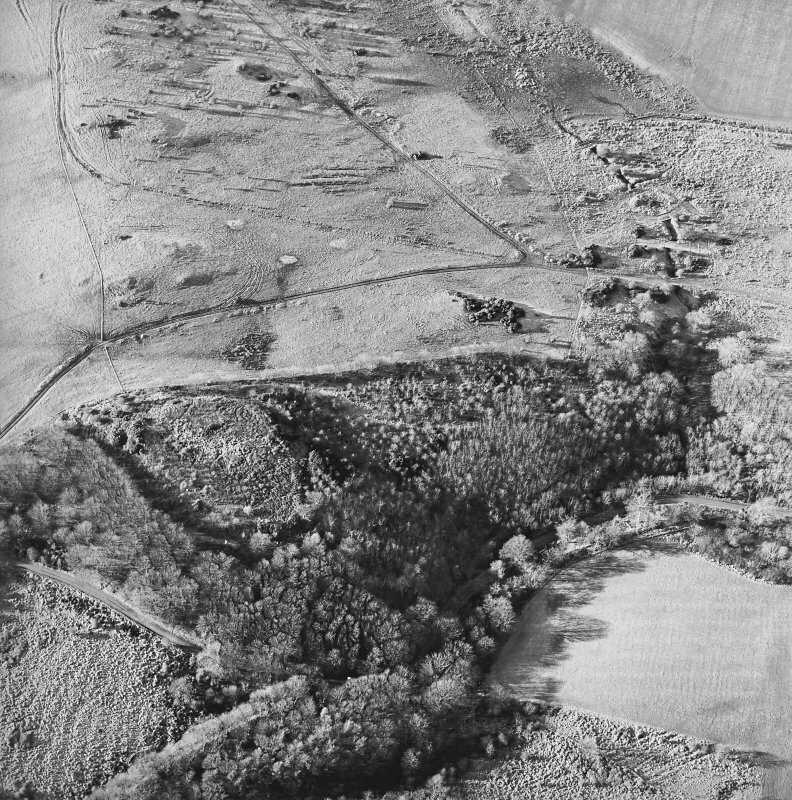 Oblique aerial view of Kirkcudbright training area centred on the firing position and field banks with tank track adjacent, taken from the NE. 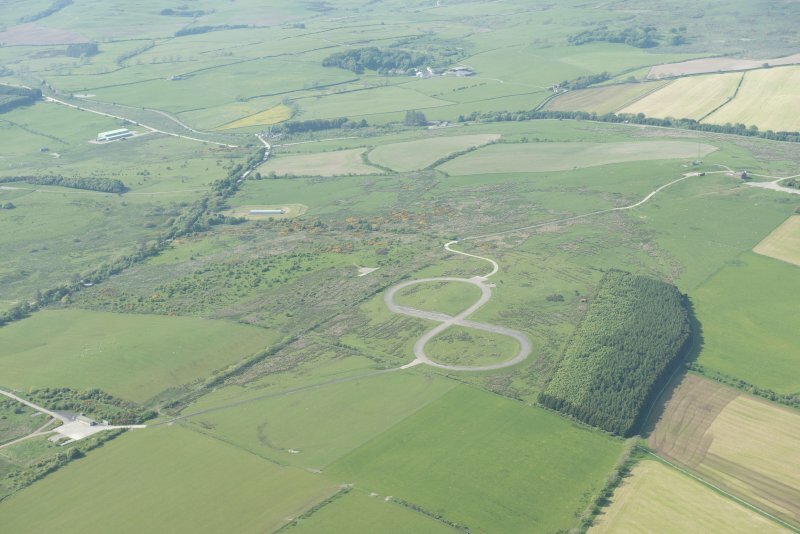 Oblique aerial view of Kirkcudbright training area centred on the firing position and field banks with tank track adjacent, taken from the NNE. 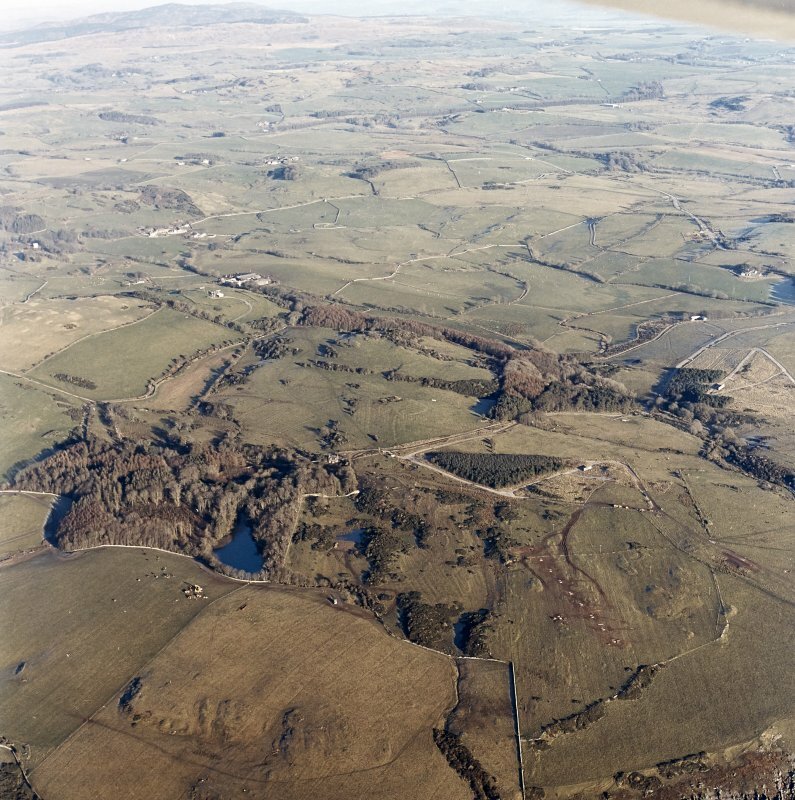 Oblique aerial view of Brown Hill centred on a firing position, taken from the SW.
Oblique aerial view of Kirkcudbright training area centred on Girdstingwood Headquarters, taken from the SSE. 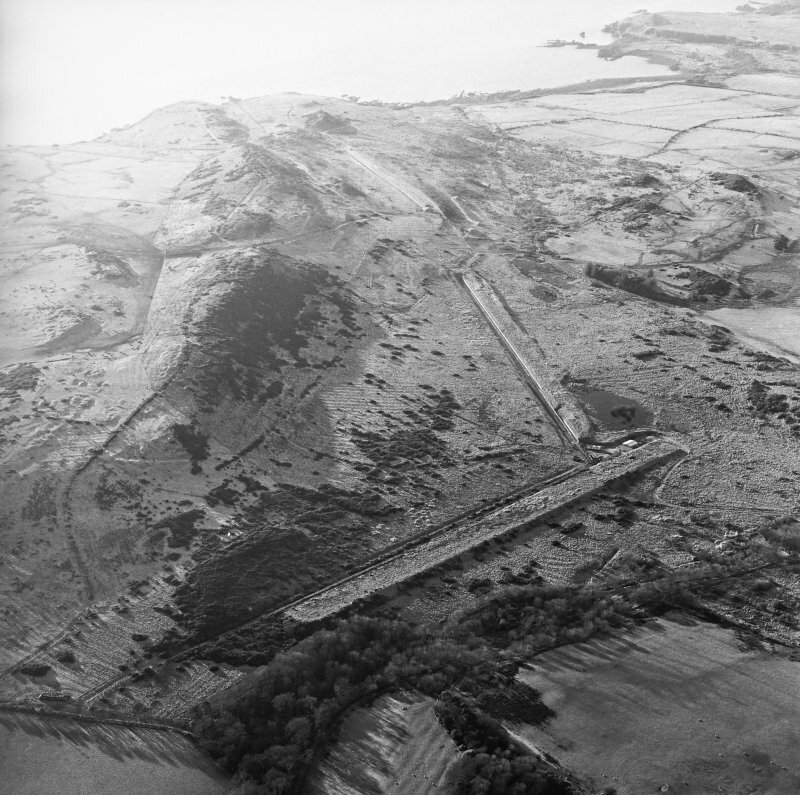 Oblique aerial view of Craigraploch centred on tracked target and rig, taken from the NNE. 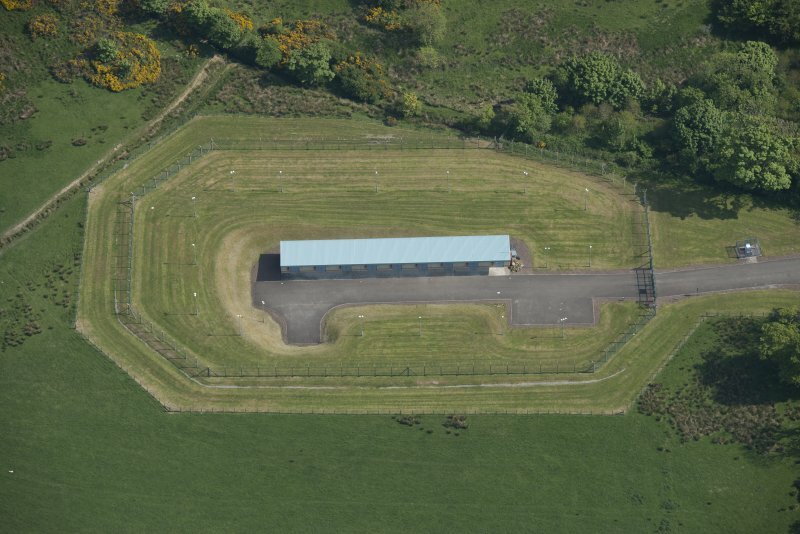 Oblique aerial view of Kirkcudbright training area centred on the tank track and field banks with firing position adjacent, taken from the S.
Oblique aerial view of Kirkcudbright training area centred on the tank track and field banks with firing position adjacent, taken from the SSW. 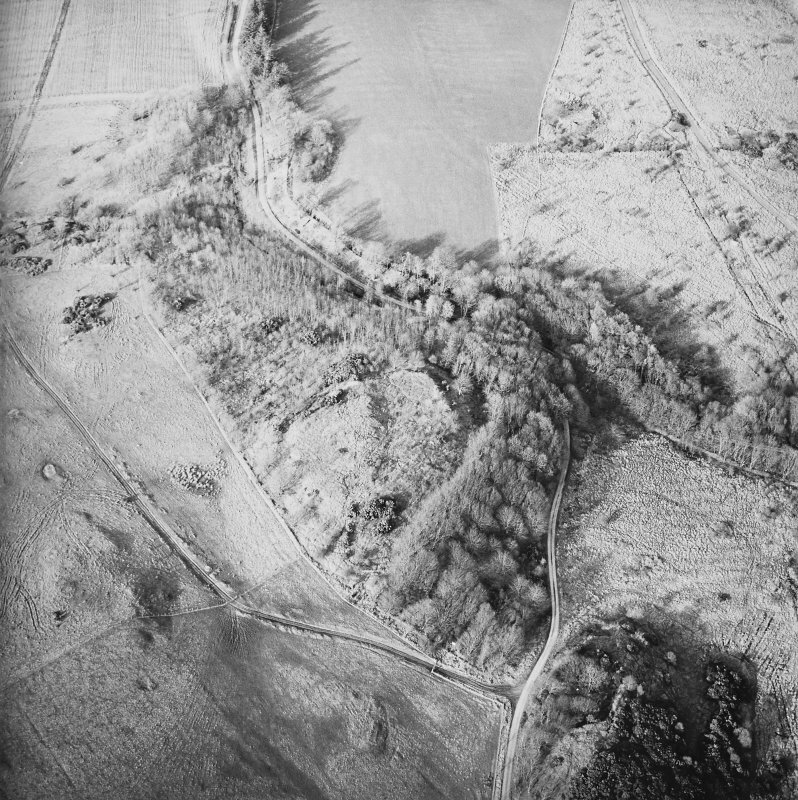 Oblique aerial view of Brown Hill centred on a firing position, taken from the NW. 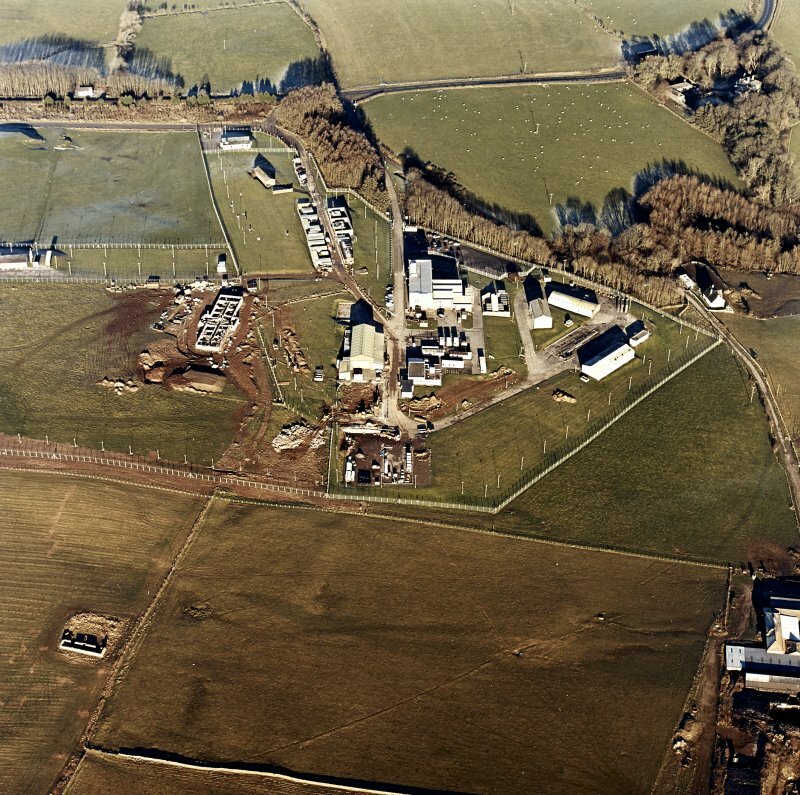 Oblique aerial view of Kirkcudbright training area centred on Girdstingwood Headquarters, taken from the SE. 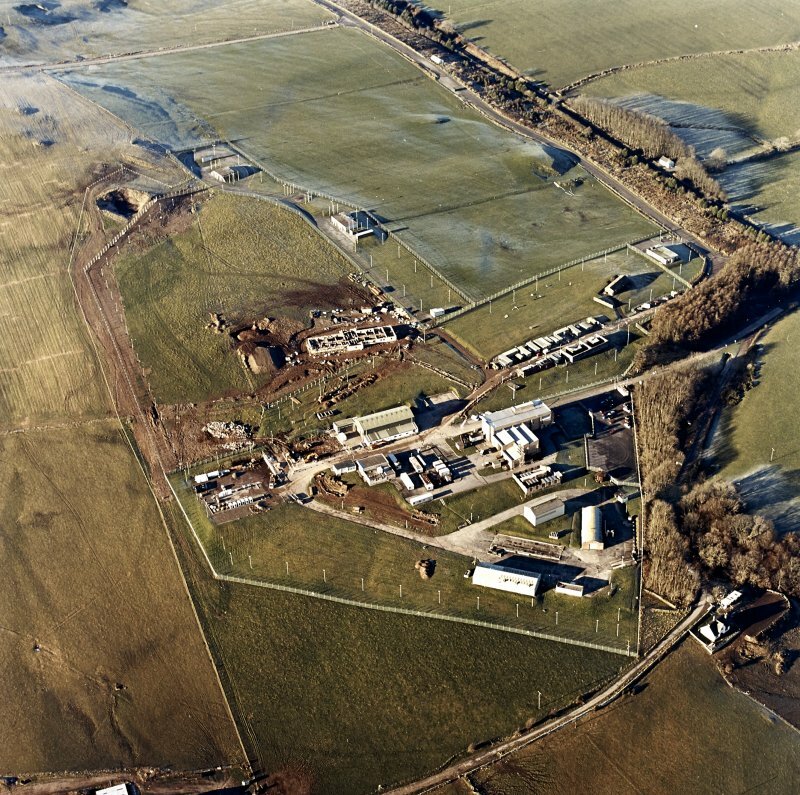 Oblique aerial view of QinetiQ building with the tank crossing points (NX 7229 4667)beyond, looking SSW. 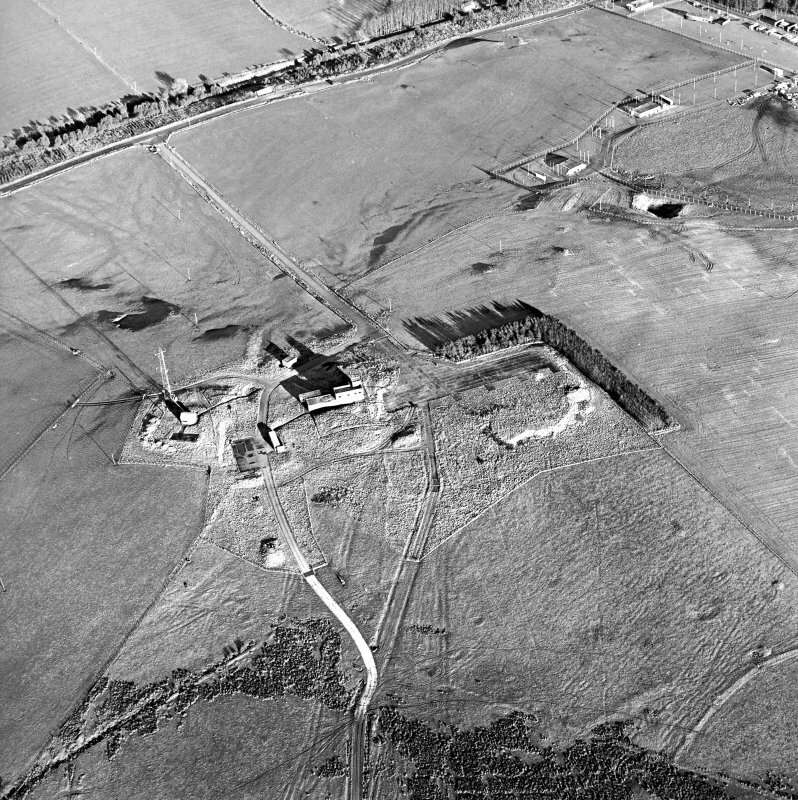 Oblique aerial view of the firing position and buildings at Brown Hill, looking WSW. 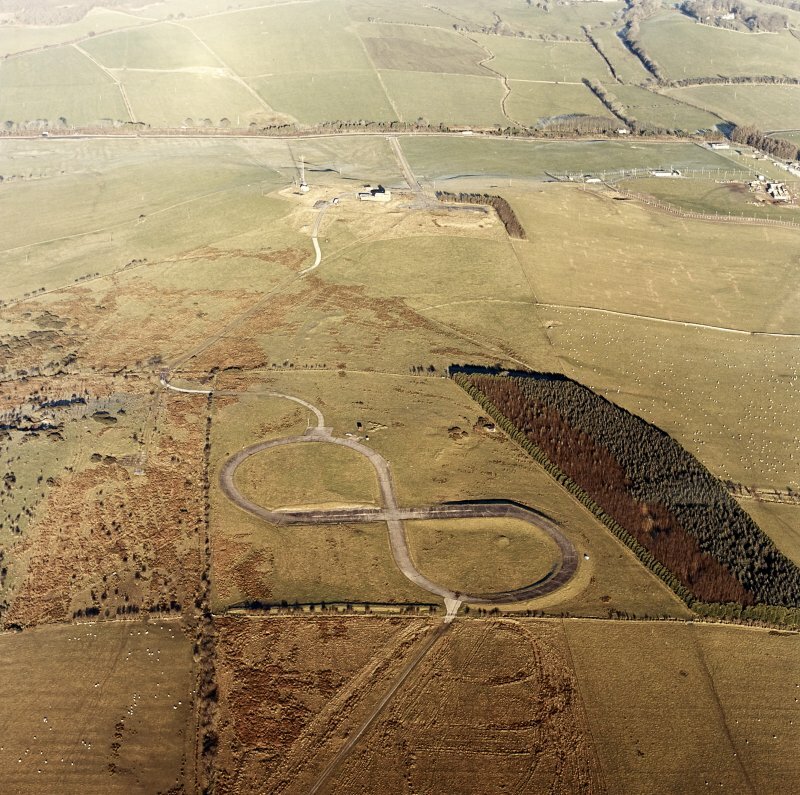 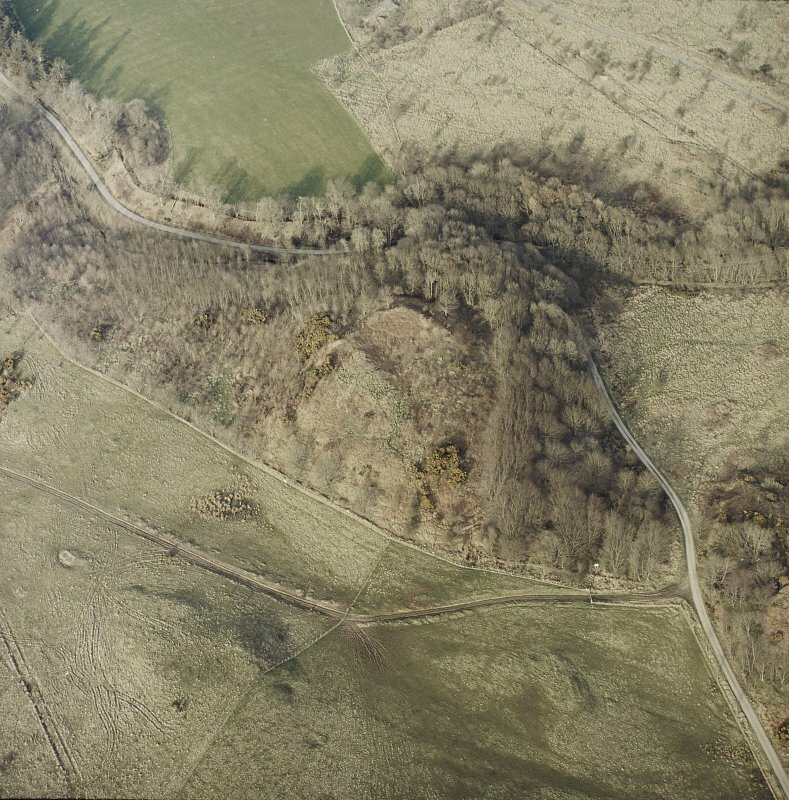 General oblique aerial view of the E part of the Kirkcudbright Training Area centred on the 'figure-of-eight' tracked target at High Barcheskie, looking NNW. 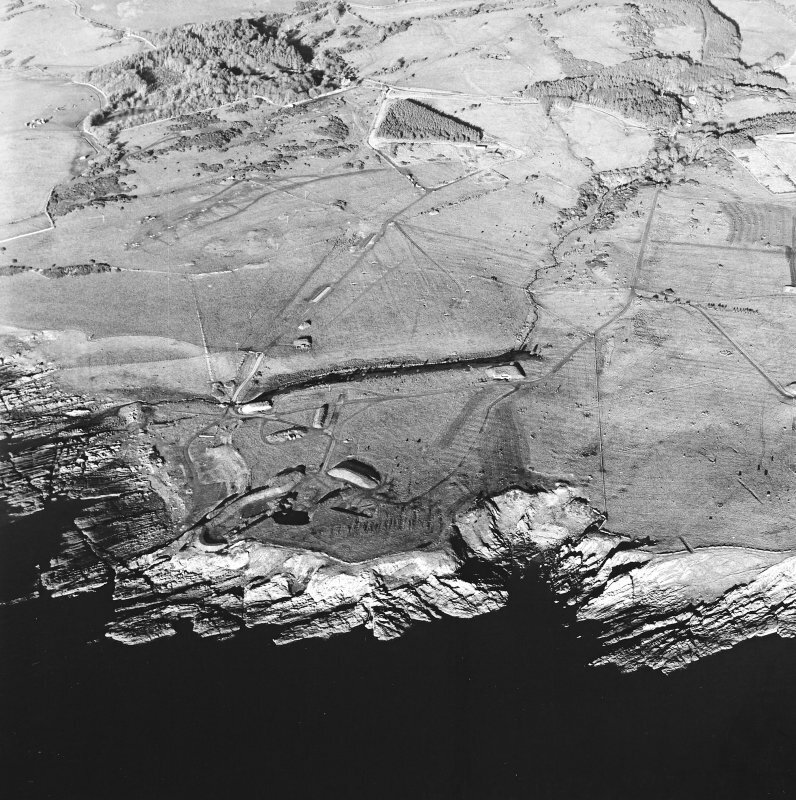 Oblique aerial view of the building and firing position at Silver Hill, looking SW.
General oblique aerial view of the W part of the Kirkcudbright Training Area centred on Balmae and Little Balmae with Gipsy Point in the foreground, looking NNW. 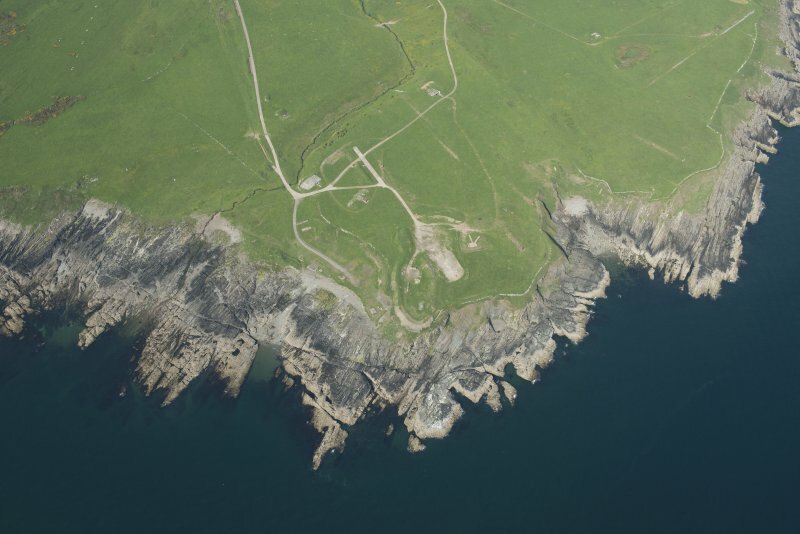 Oblique aerial view of Gipsy Point, looking NE. 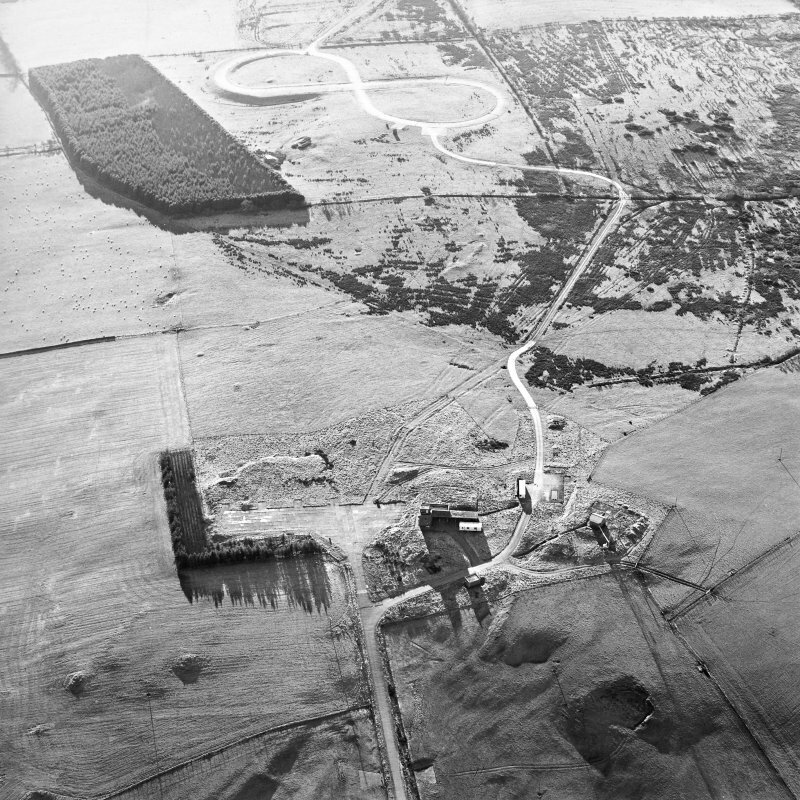 Oblique aerial view of the tank crossing points (NX 7152 4657), looking ENE. 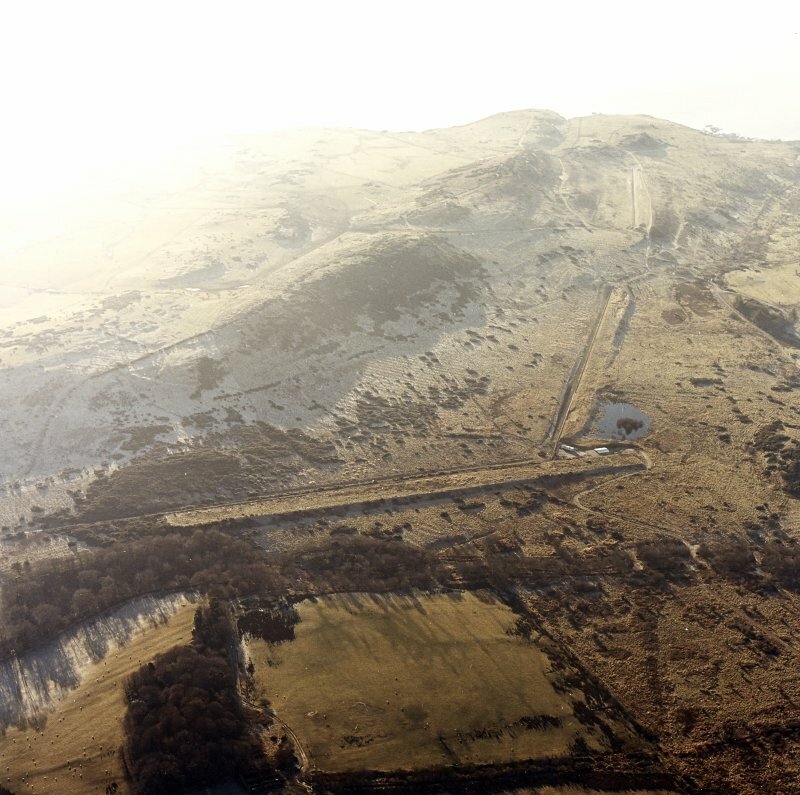 Oblique aerial view of the Doon Hill firing point and Doon Hill fort, looking SSE. 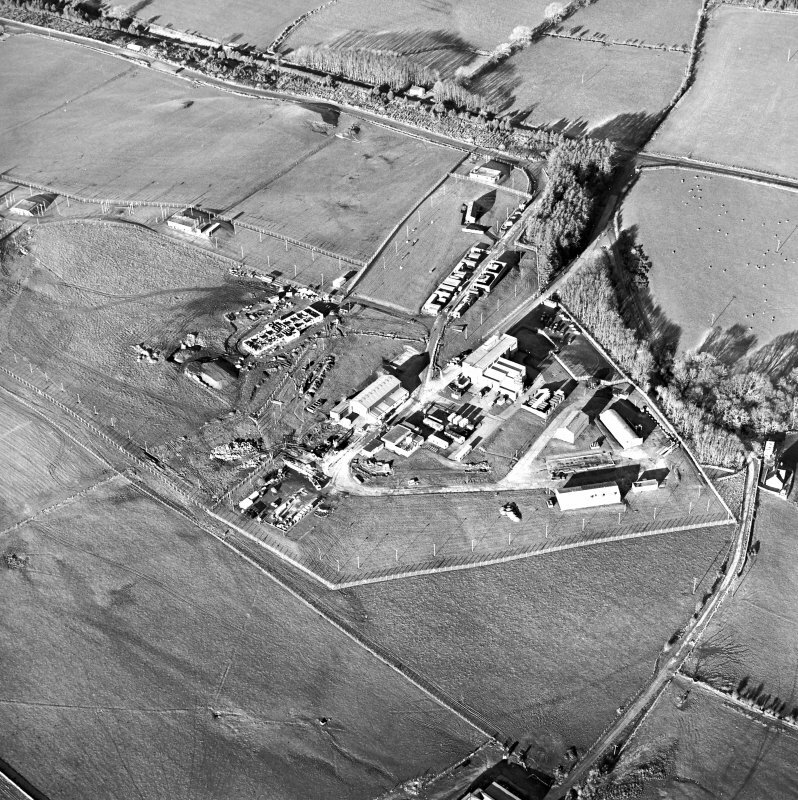 Oblique aerial view of the ammunition store at NX 7104 4565, looking ENE. 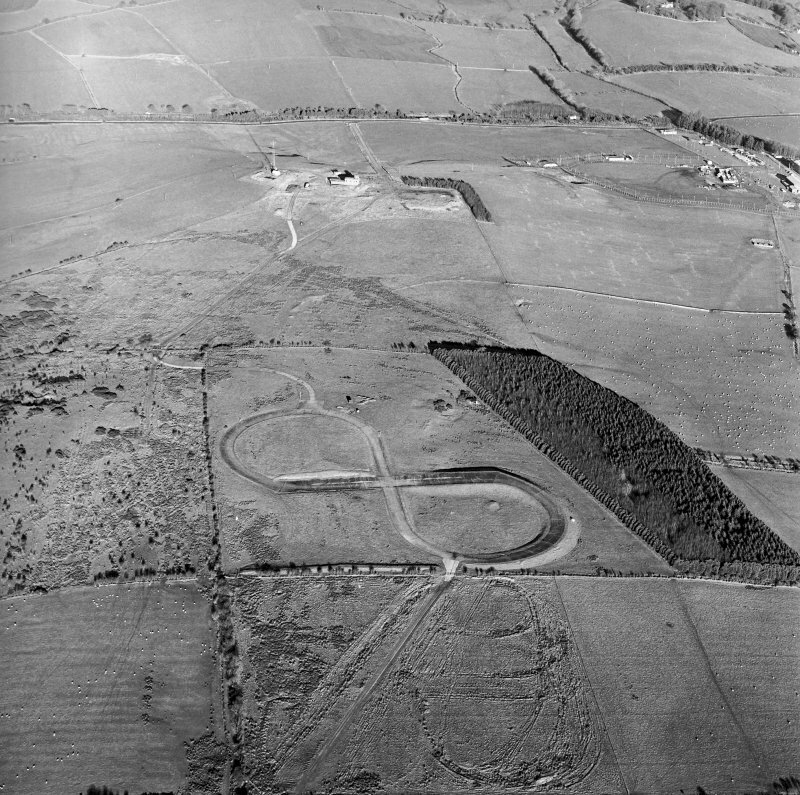 Oblique aerial view of the overhead gantry target at Little Raeberry, looking S.
Oblique aerial view of the overhead gantry target at Little Raeberry, looking N.
Oblique aerial view of the sheds near Howwell, looking S.
Oblique aerial view of the control tower, looking SE. 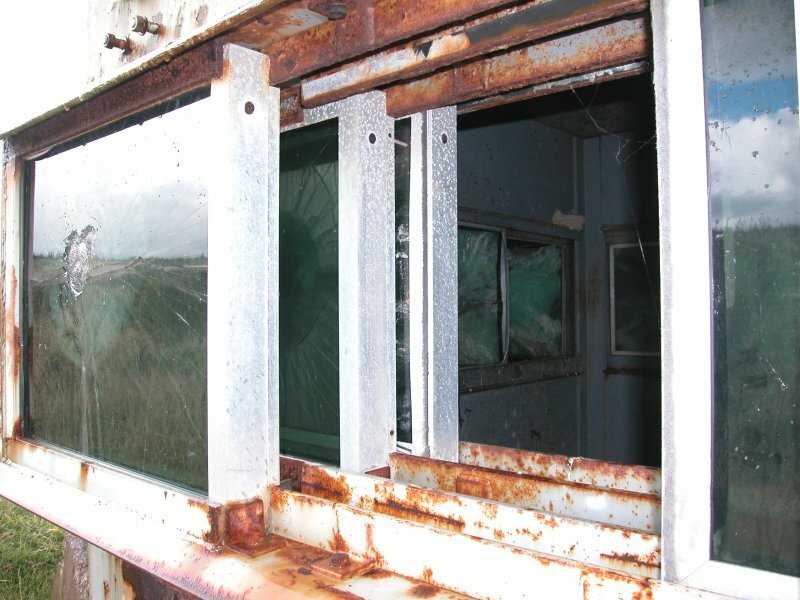 View of photo-chronic cell (or PCC) stop mounting from the W. The PCC is a time measuring device for testing the velocity of shells. 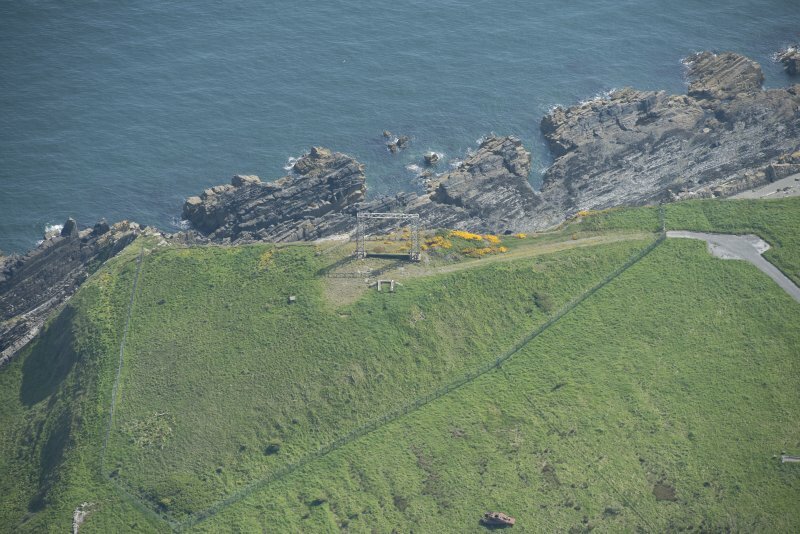 General oblique aerial view looking over field-system, rig, firing position and gantry target towards Kirkcudbright Bay, taken from the SE. 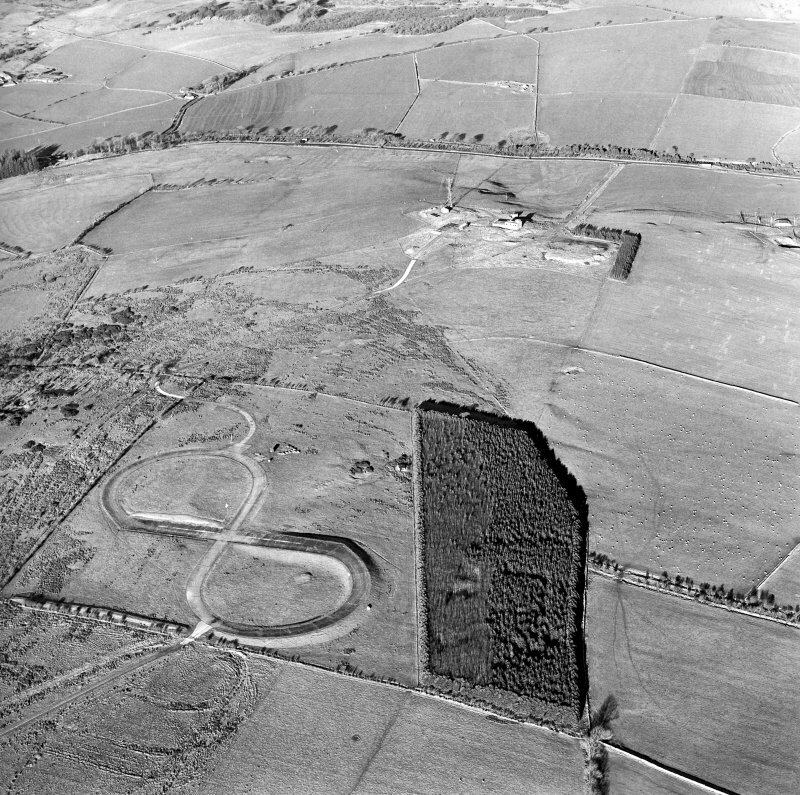 Oblique aerial view of Netherlaw centred on fort and tank crossing points, taken from the ESE. 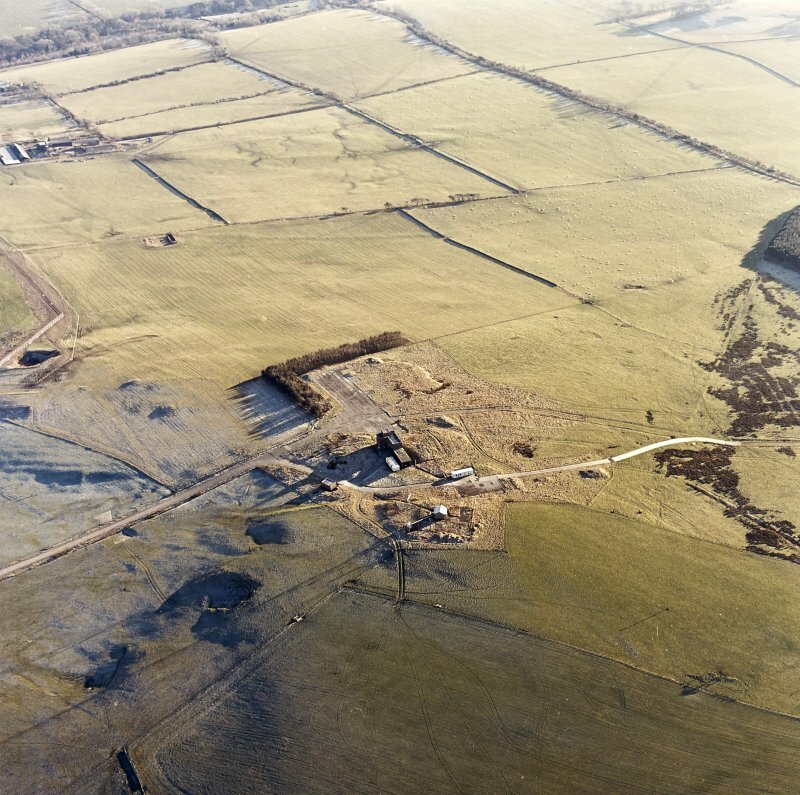 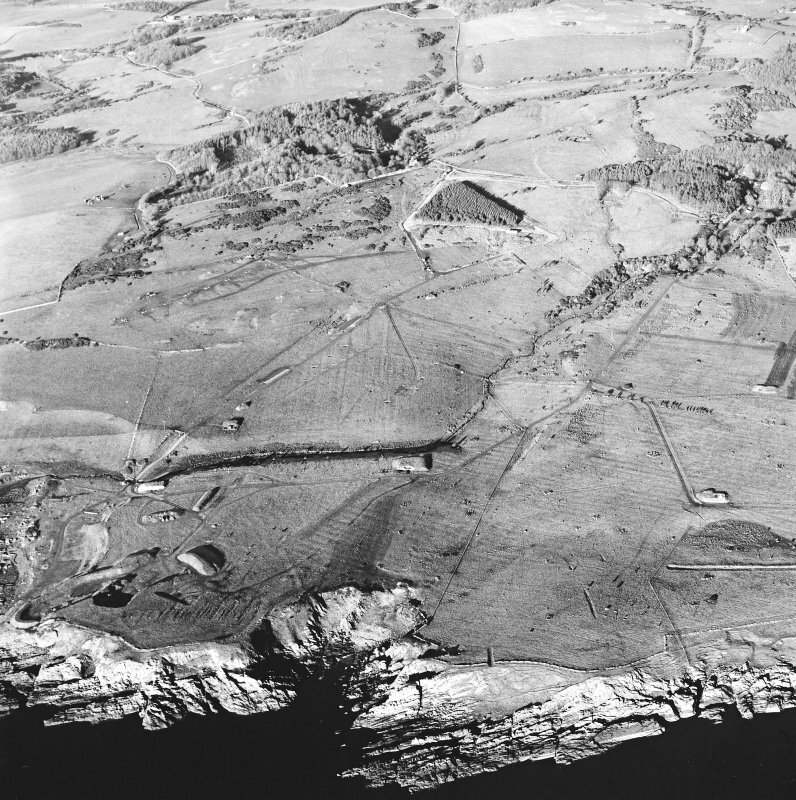 Oblique aerial view centred on the remains of the homestead with field banks and rig adjacent, taken from the ESE. 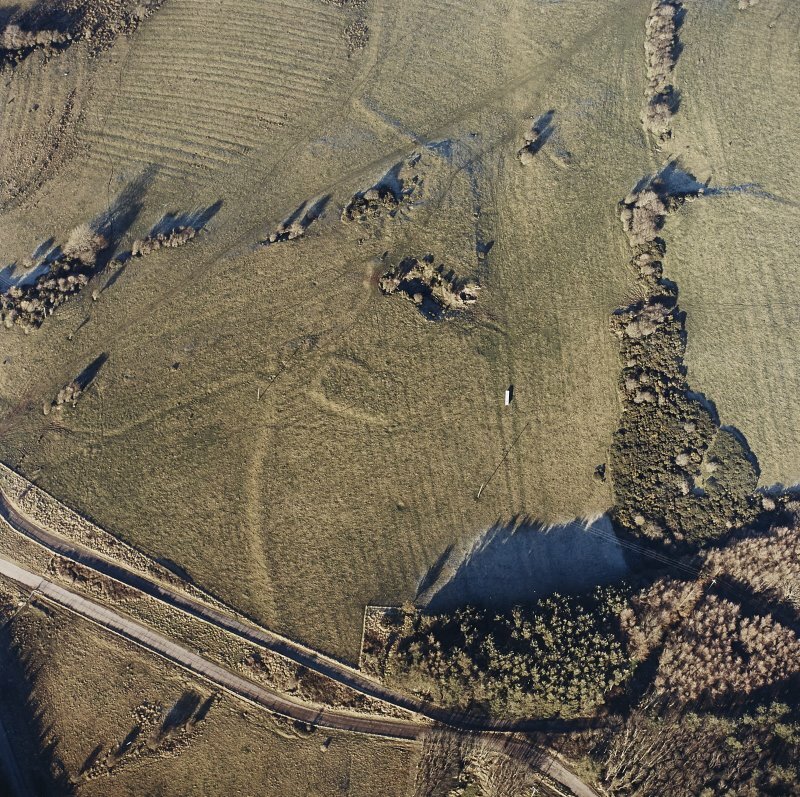 Oblique aerial view centred on the remains of the homestead with field banks and rig adjacent, taken from the W.
Oblique aerial view centred on the remains of the church, burial ground, homestead moat and building with rig adjacent, taken from the NNW. 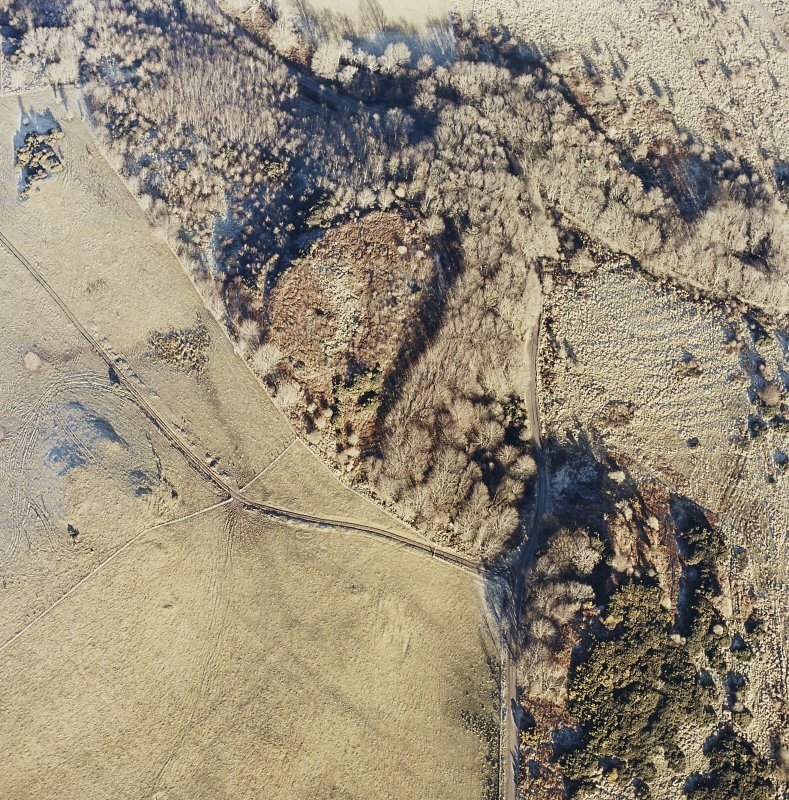 Oblique aerial view centred on the remains of the church, burial ground, homestead moat and building with rig adjacent, taken from the WNW. 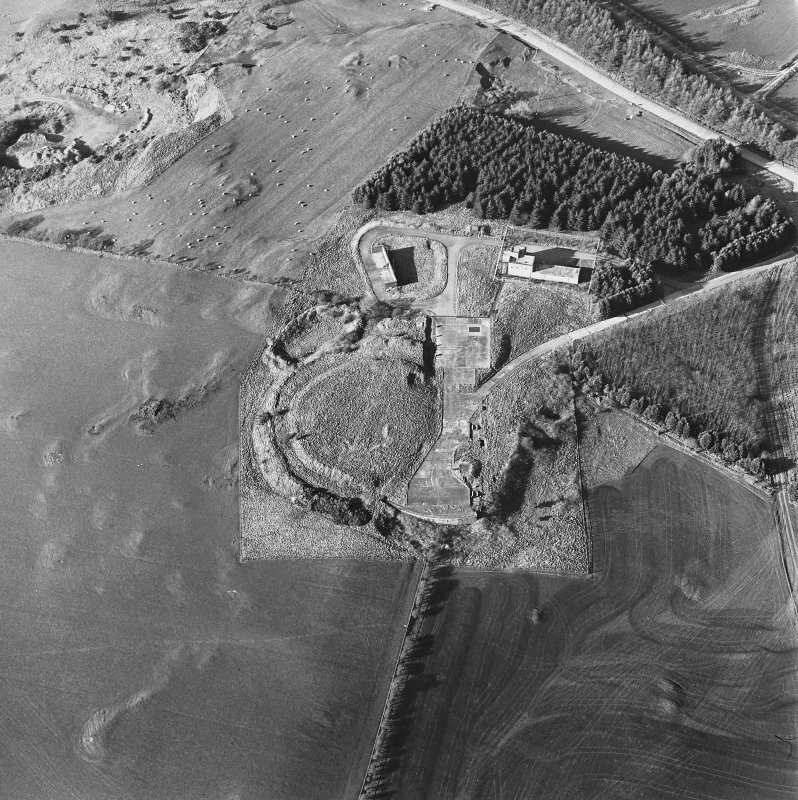 Oblique aerial view centred on the remains of rig with church, burial ground, homestead moat and building adjacent, taken from the NW. 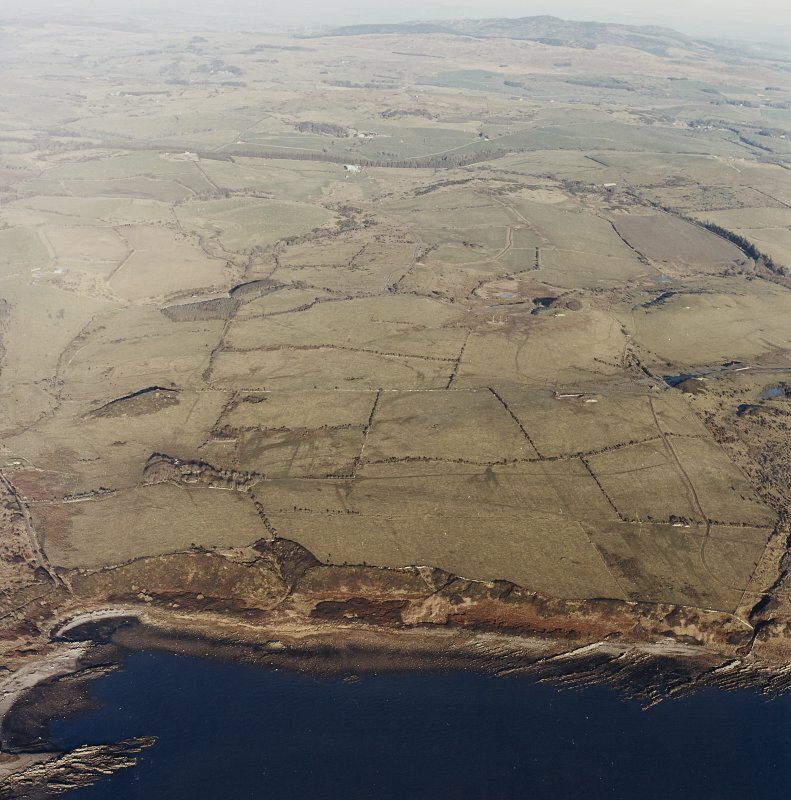 Oblique aerial view of Gypsy Point centred on the remains of field banks and rig with firing point and tracked target adjacent, taken from the SW.
General oblique aerial view of Kirkcudbright training area looking over Gypsy Point towards Kirkcudbright Bay, taken from the SE. 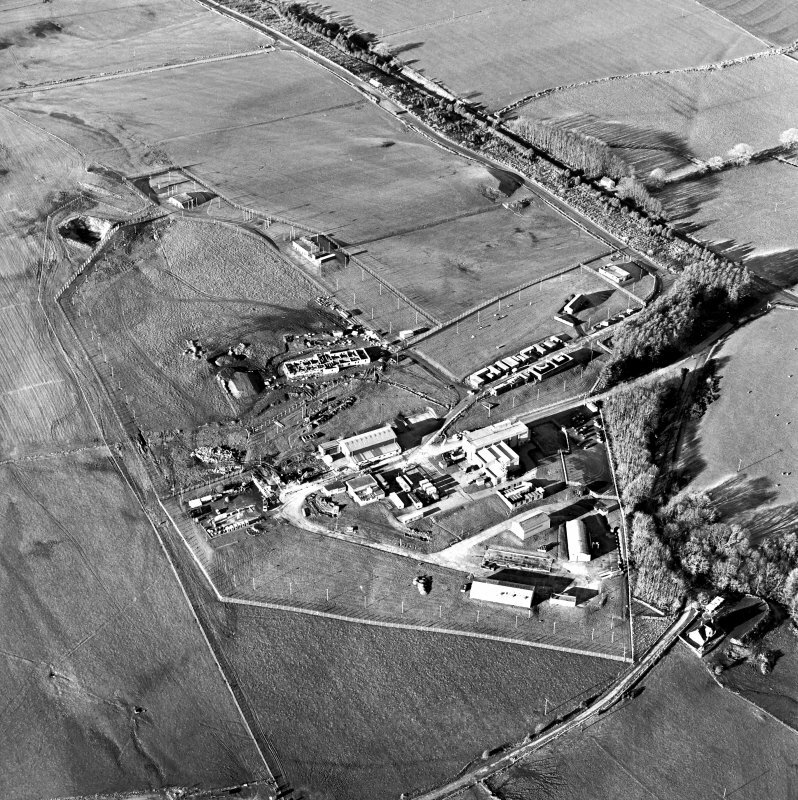 General oblique aerial view of Kirkcudbright training area looking over firing points, tank road and the remains of field banks and rig, taken from the SW.
Oblique aerial view of Craigraploch centred on tracked target and rig, taken from the W.
Oblique aerial view of Kirkcudbright training area centred on Girdstingwood Headquarters with buildings adjacent, taken from the SSW. 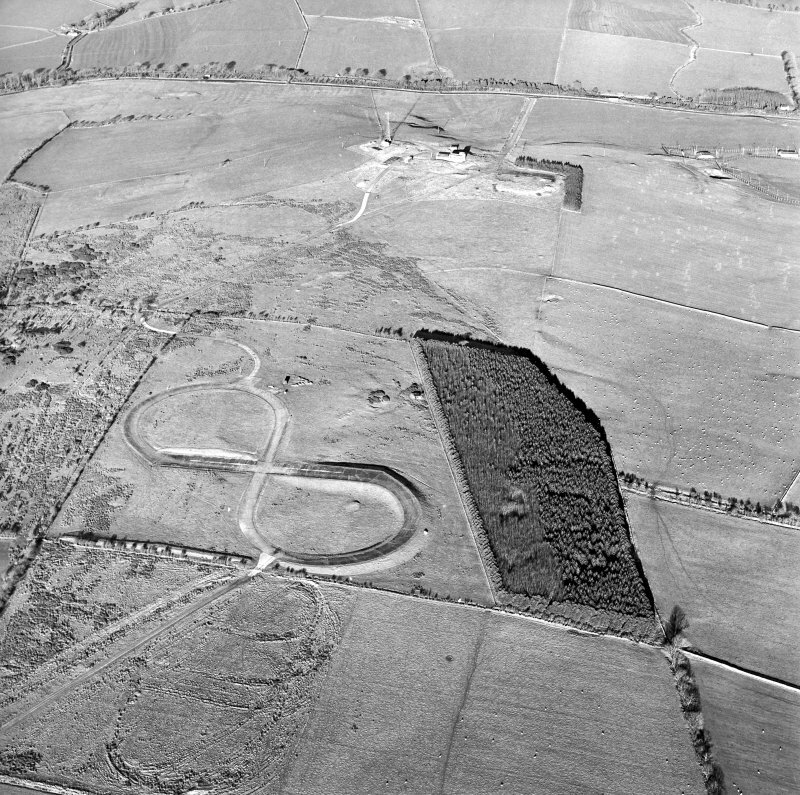 Oblique aerial view of the building and firing position at Brown Hill, looking S.
Oblique aerial view of Girdstingwood, looking NNW. 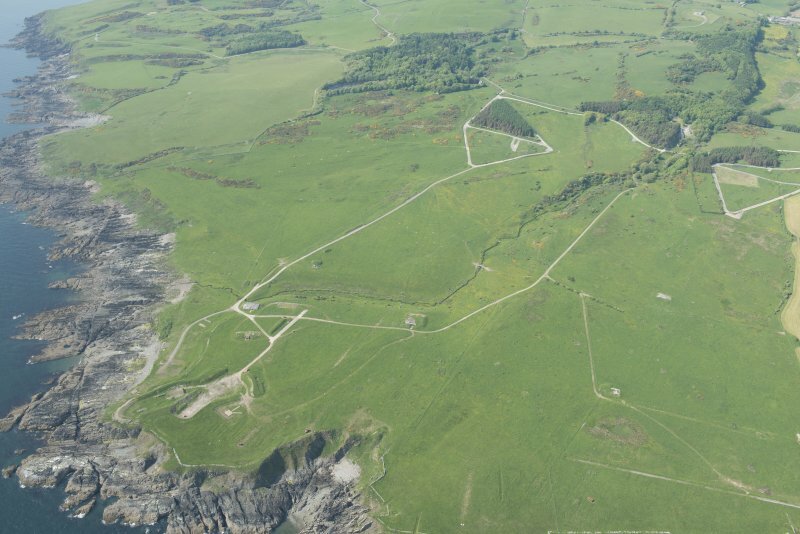 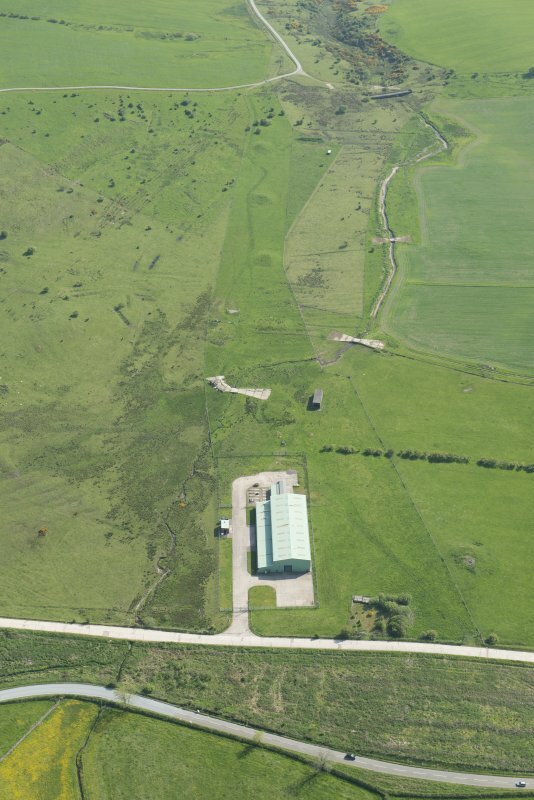 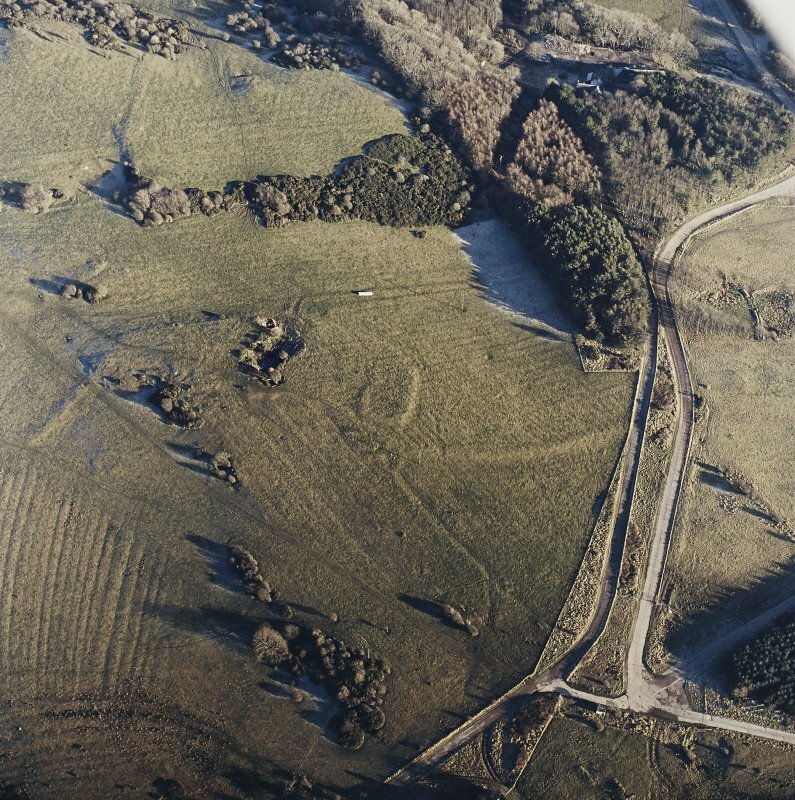 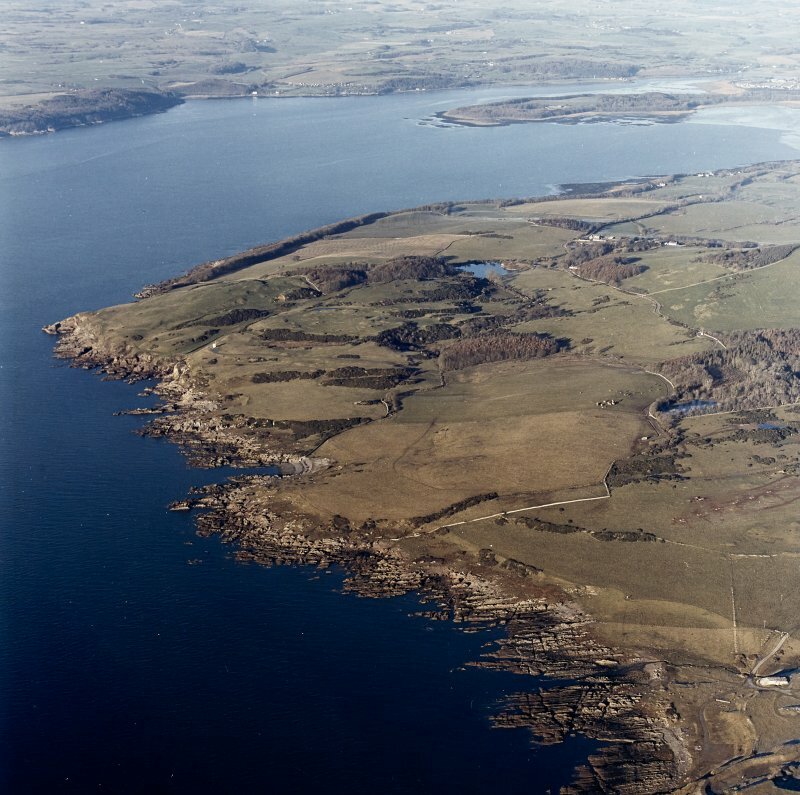 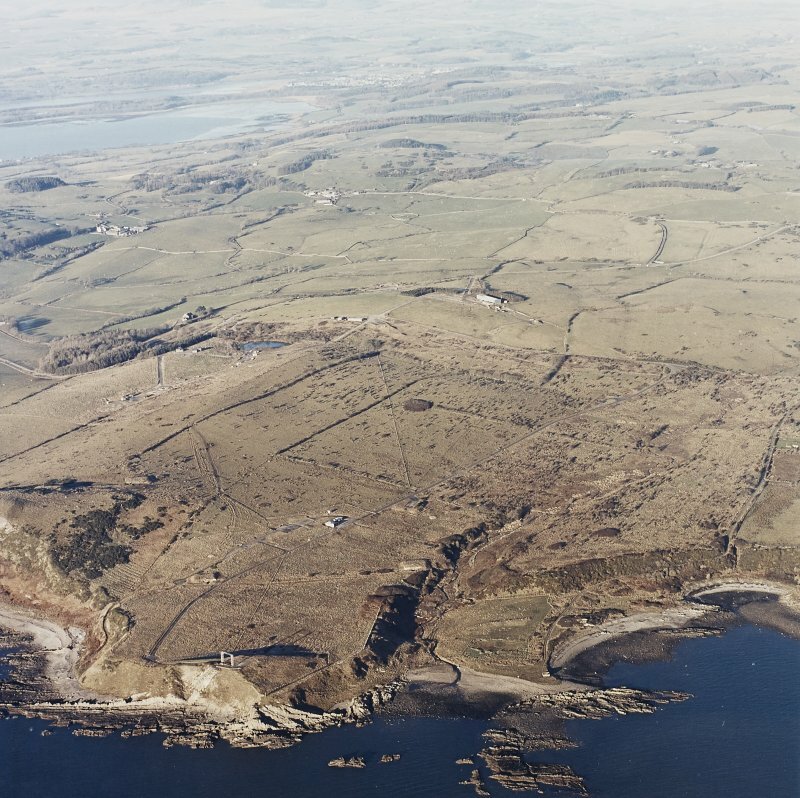 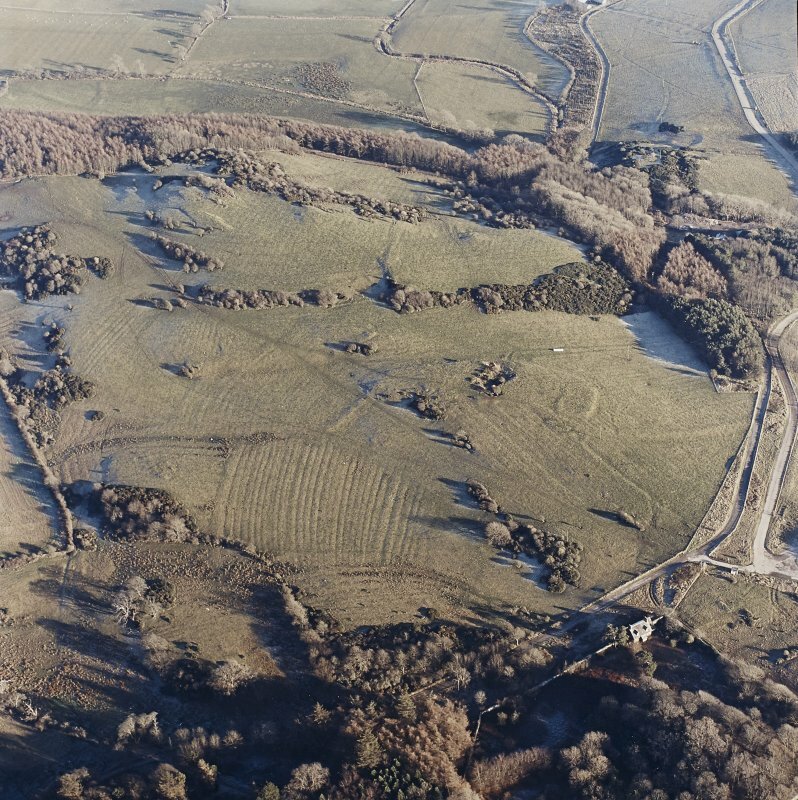 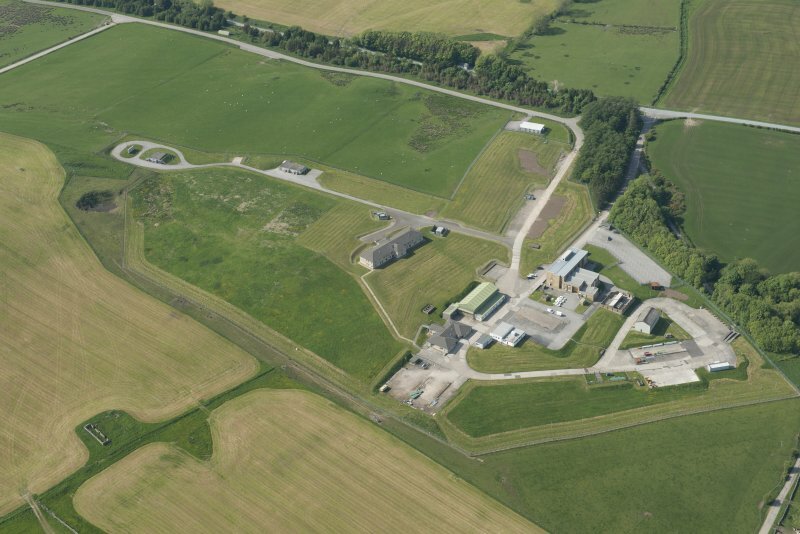 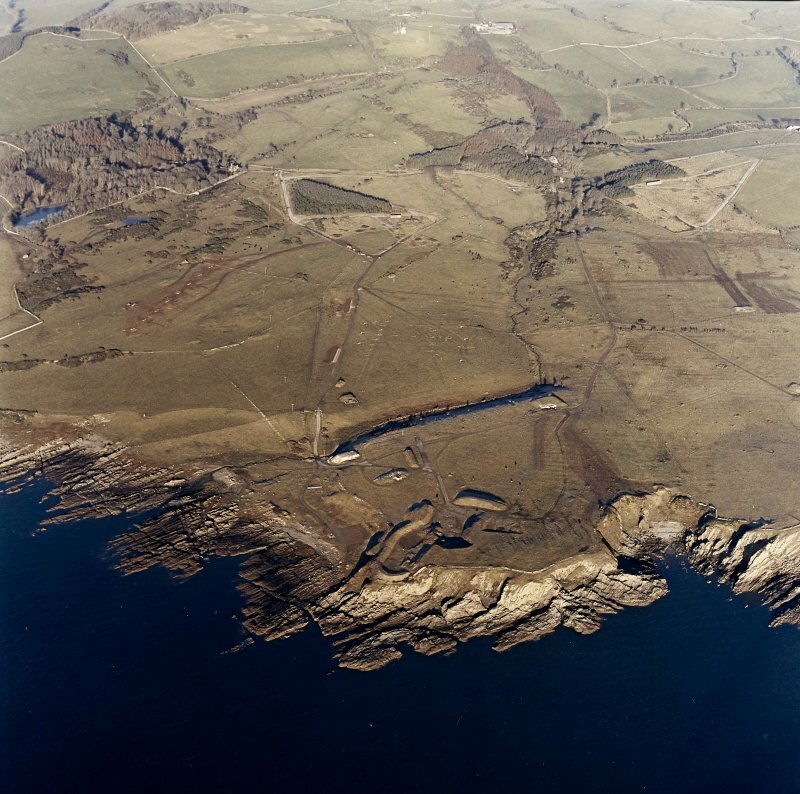 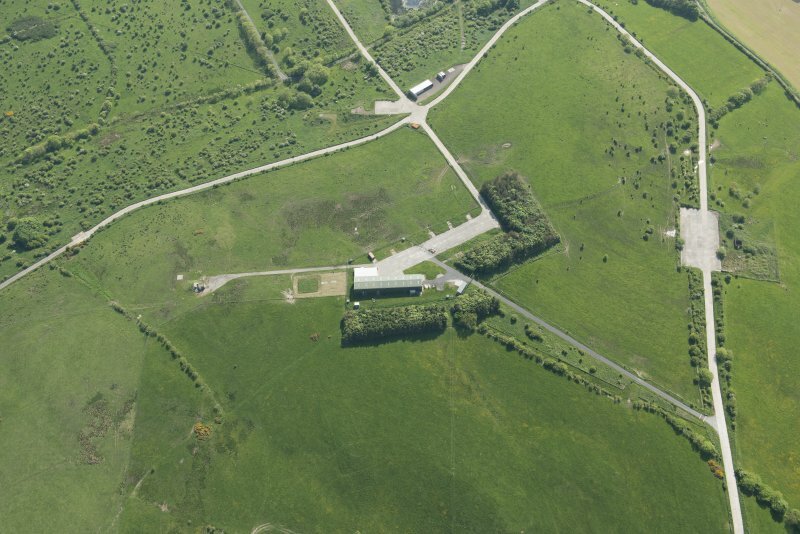 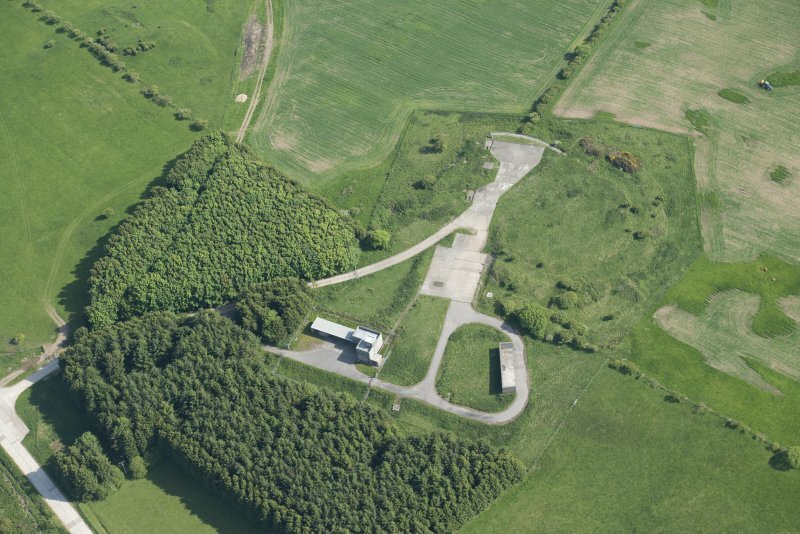 This description of the Kirkcudbright Training Area (KTA) is based on an archaeological survey by RCAHMS during 2002, examination of aerial photography taken in 1946, 1962, 1975 and 1988, and on discussions with staff at Range Control Castle Hill. 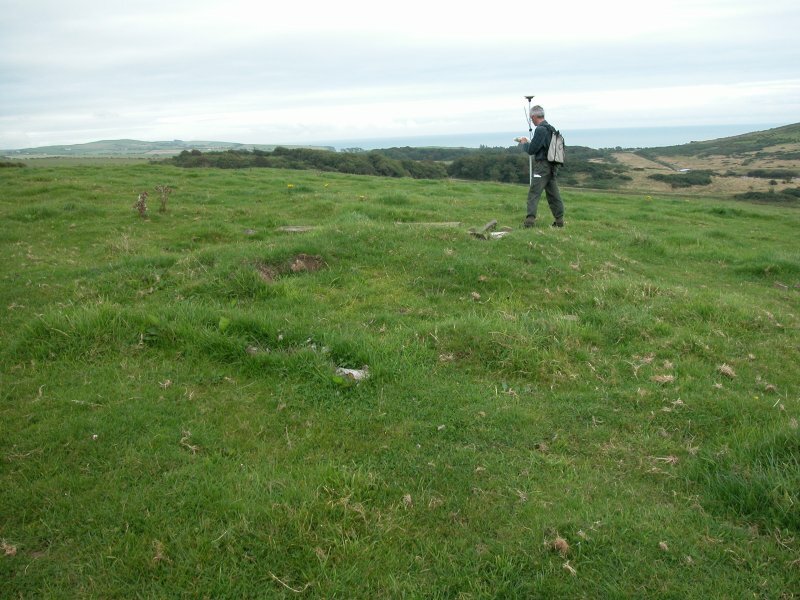 A generalised description of the chronology of activity on the range is followed by a description its constituent parts. 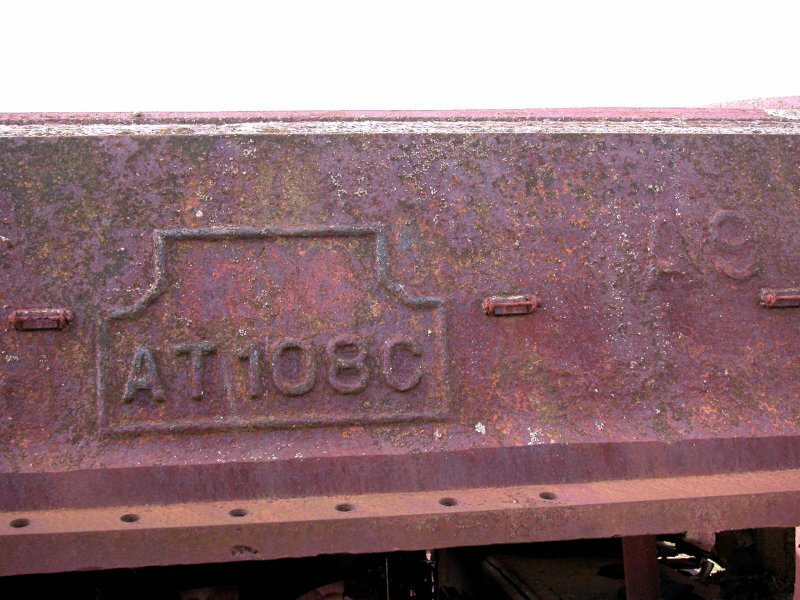 It is expected that this description will be enhanced by further research on the military history of the KTA. 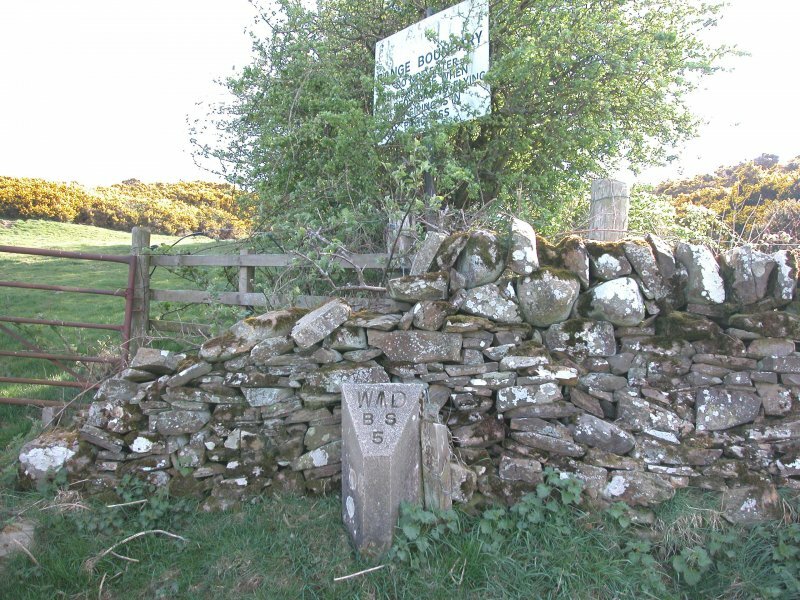 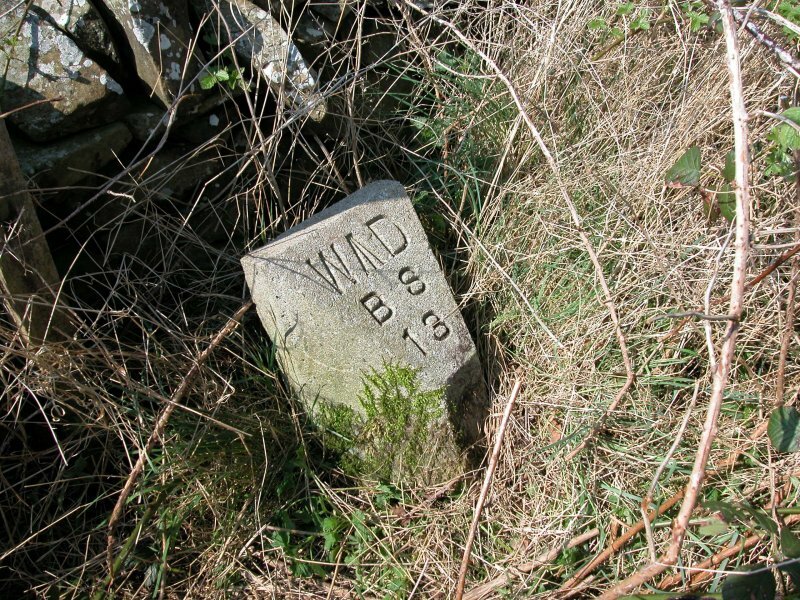 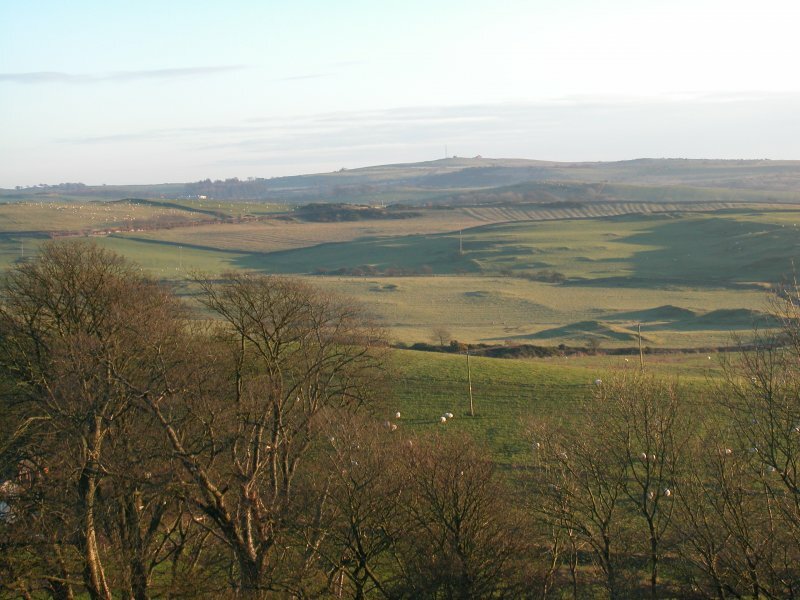 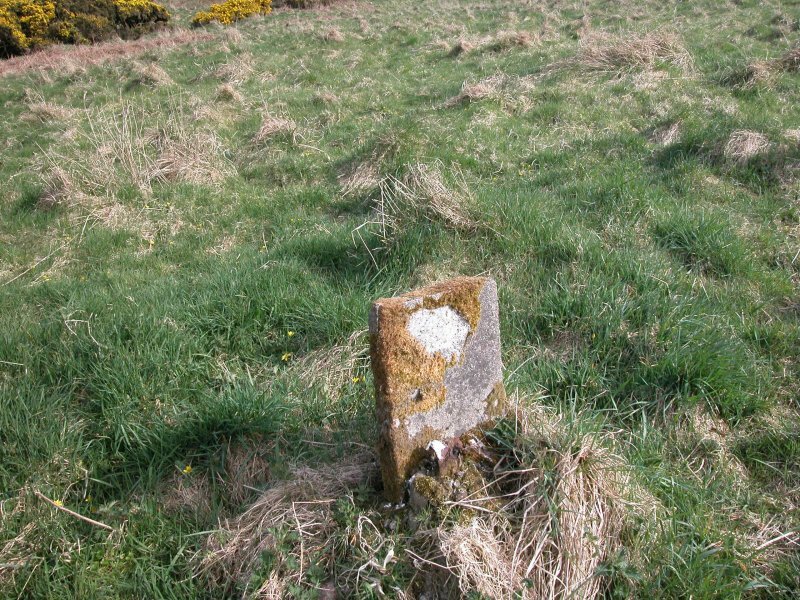 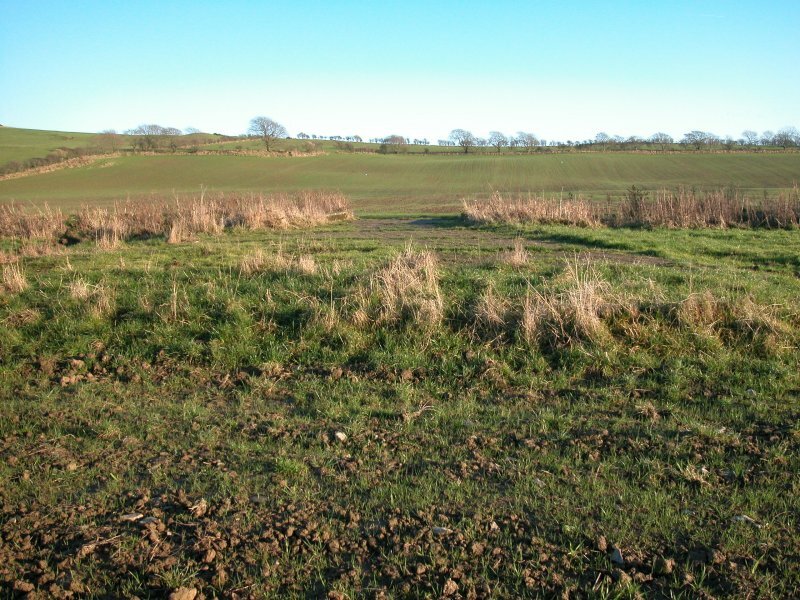 The KTA was acquired by the War Office in 1942 and extends across an area of about 19 square km, comprising the greater part of a promontory to the S of Kirkcudbright and WSW of Dundrennan village. 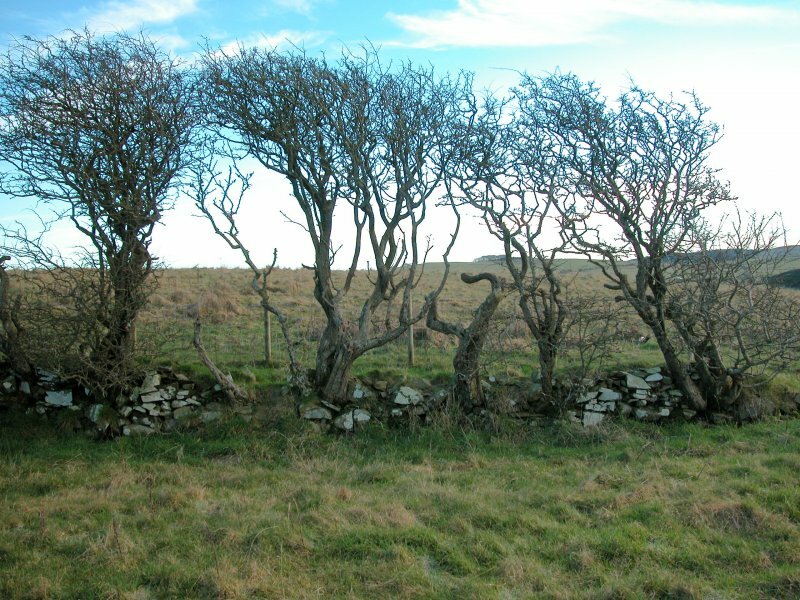 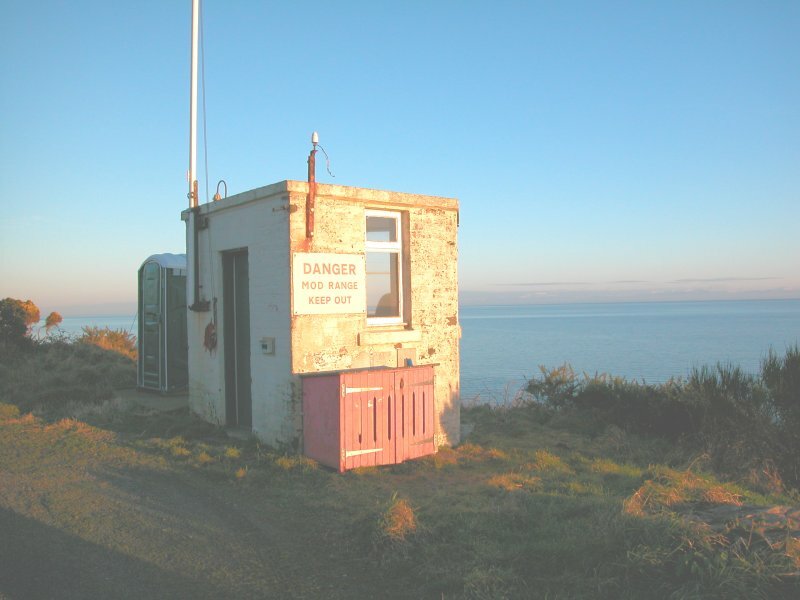 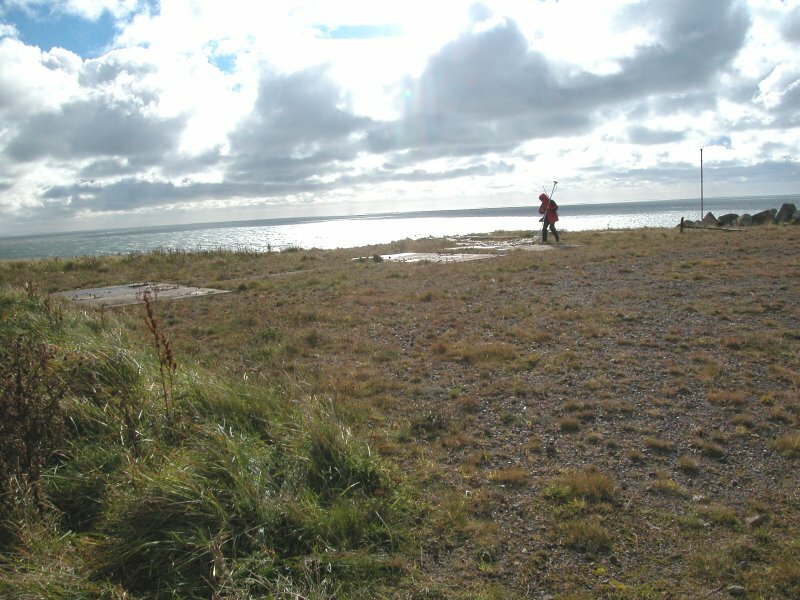 Most of the ground is S facing, relatively low undulating ground, extending from a high point on Brown Hill at 150m ASL, down to a terrace at about 20m ASL, bounded by low sea cliffs on the S. The Solway effectively forms the 'backstop' to the range, though the two local eminences of Big Raeberry and Wall Hill have also been used in this way. 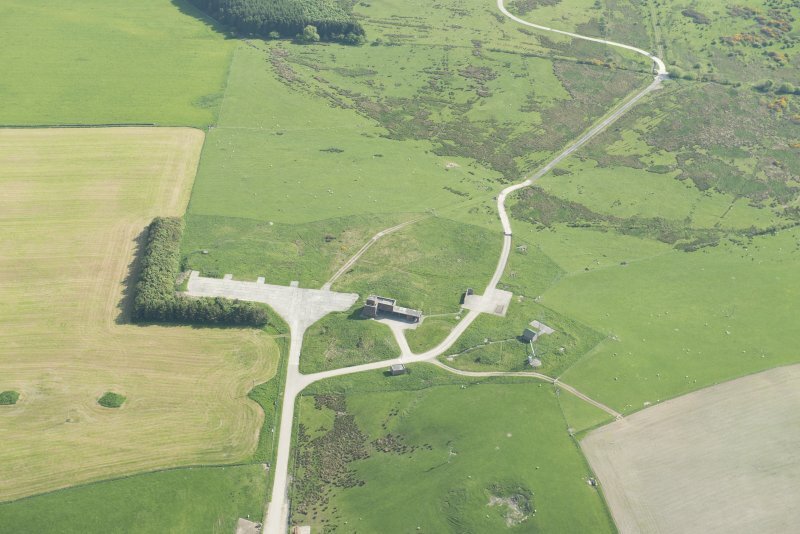 The functional parts of the range can be divided between firing positions dispersed across the N and connected by a tank road, with targets scattered across the 'impact zone' in the central and southern parts of the range. 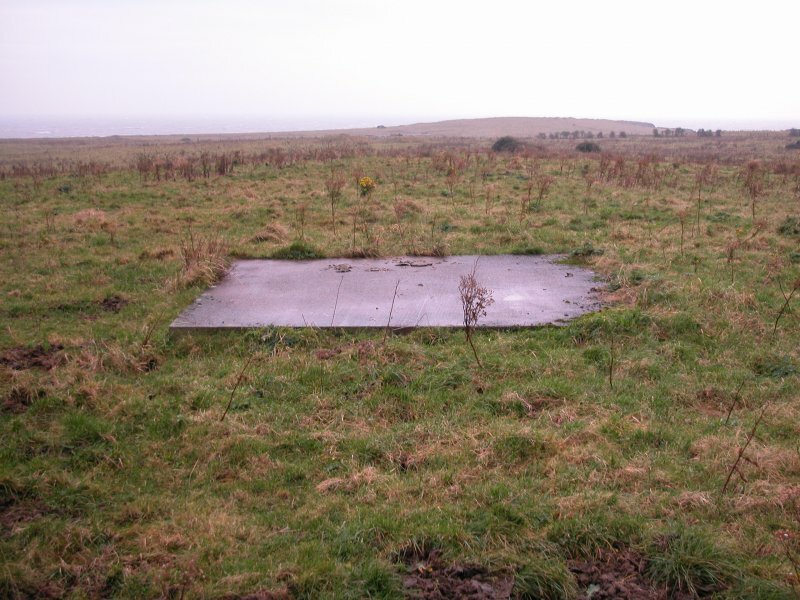 Bunkers, to provide shelter for personnel and equipment, are distributed within the impact zone. 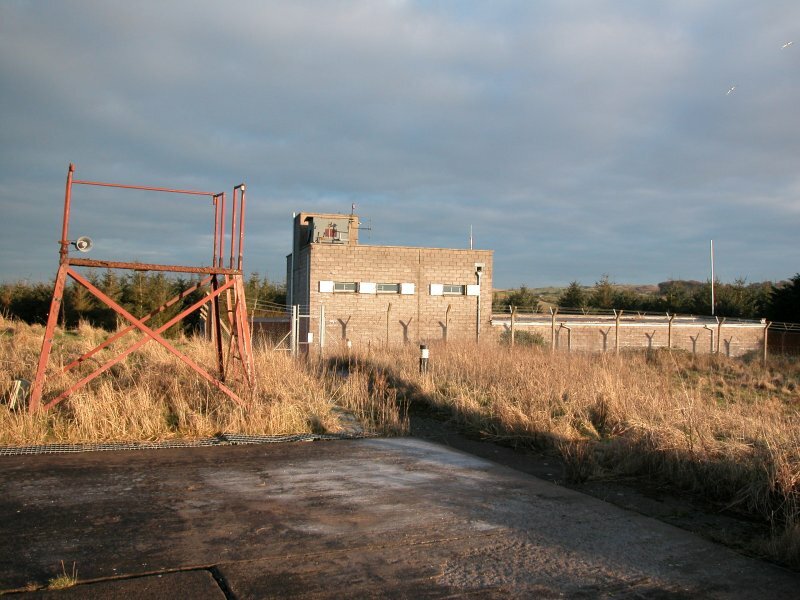 Headquarters, range control and accommodation have occupied various locations, generally at the fringes of the KTA. 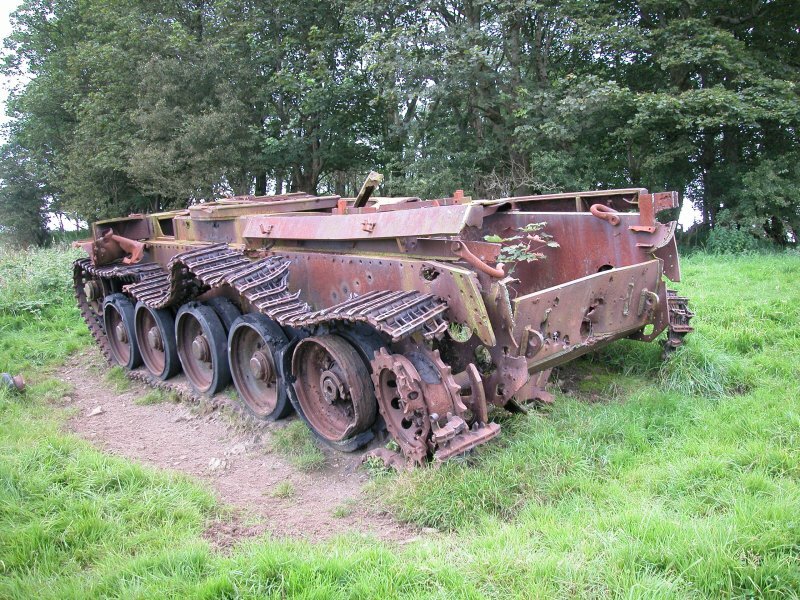 The main focus of activity on the KTA, until the recent change to Infantry Training, has been Tank Training. 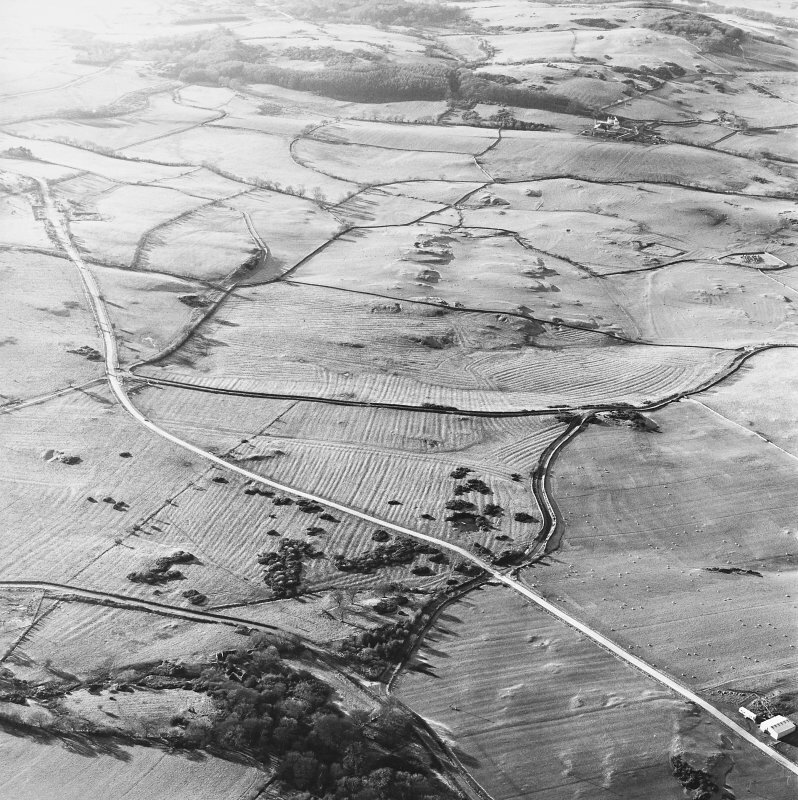 Vertical aerial photographs taken by the RAF on 4 May 1946 (106G/Scot/UK43) illustrate the early development of the range. 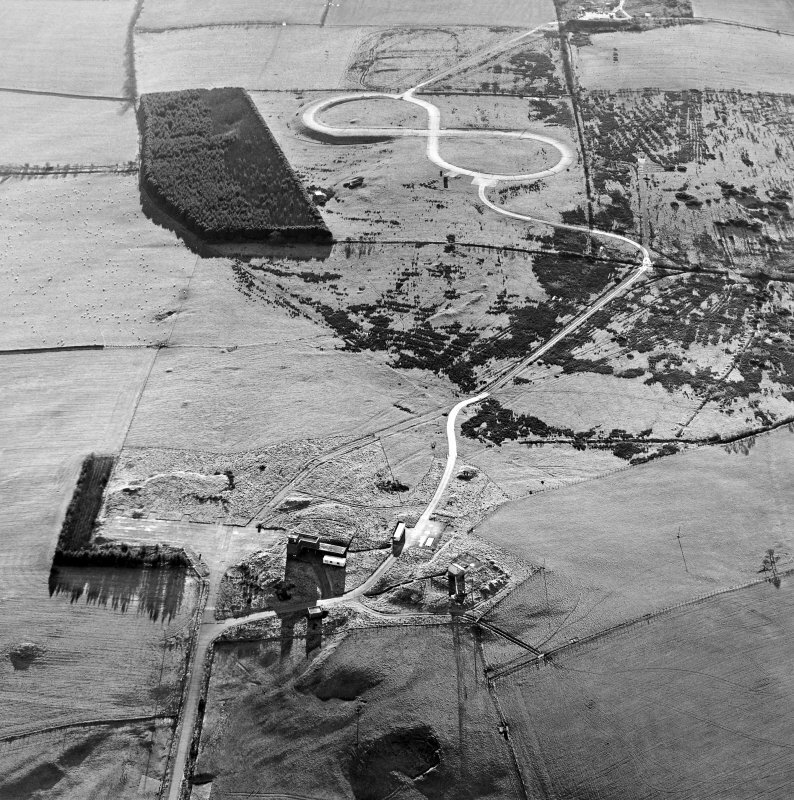 By this date many of the structural elements of the range, such as tank roads and bunkers had been completed, though disturbed ground around some structures and the lines of communication trenches visible on the photographs show that some work was undertaken in 1946. 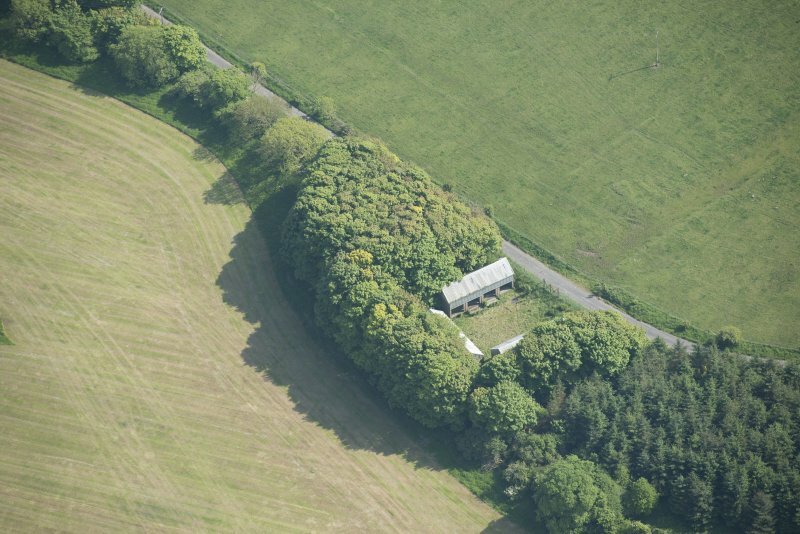 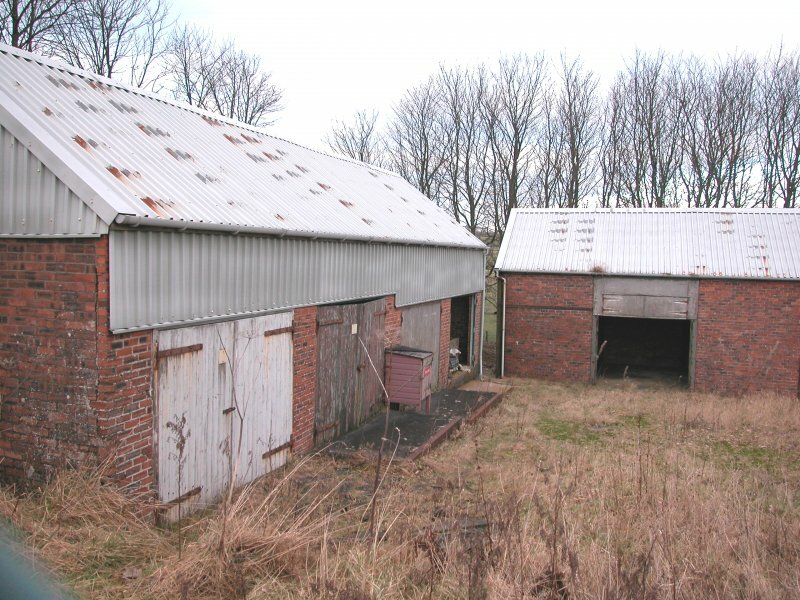 Headquarters and some accommodation was focused on Netherlaw House and there was a large group of huts and tank sheds on the N flank of Howwell Hill. 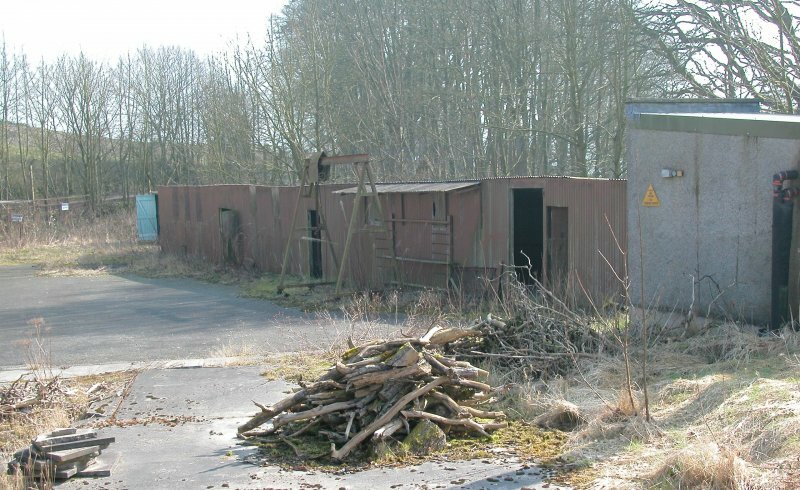 Girstingwood is established by 1946 as little more that a group of huts and shed at the E end of the tank road. 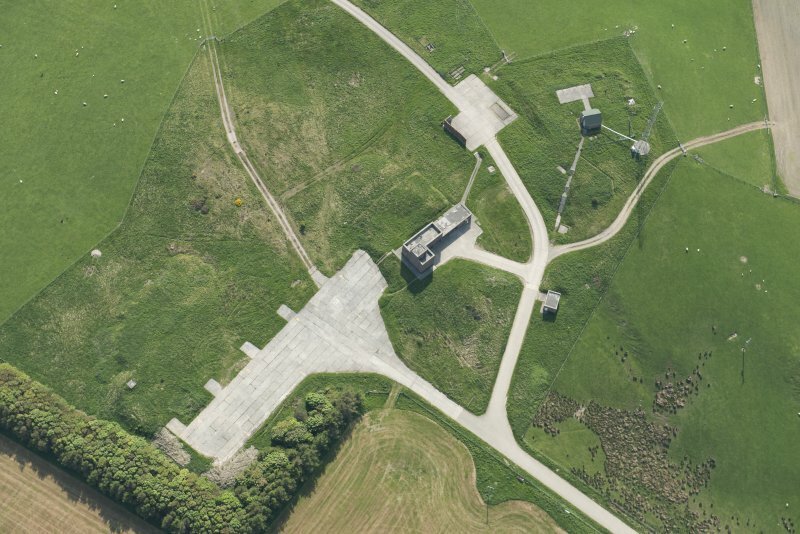 The use of the range at this date appears to have been divided between mechanised vehicle training in the eastern half of the KTA and an emphasis on firing from fixed points in the west. 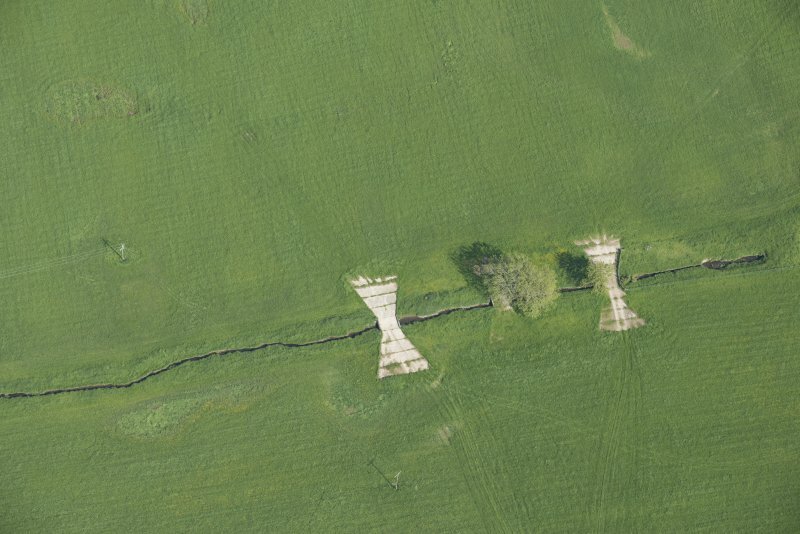 In the east the aerial photographs show extensive patterns of tracks where tracked vehicles have churned the ground surface. 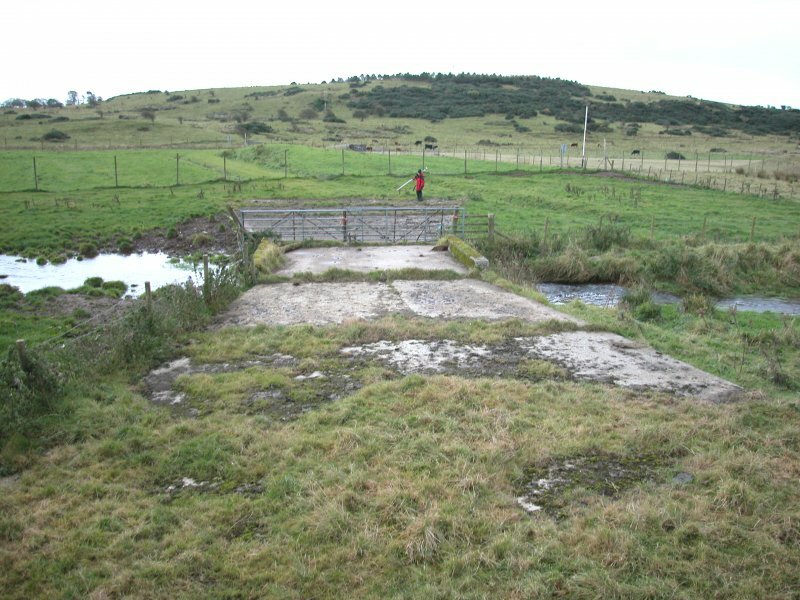 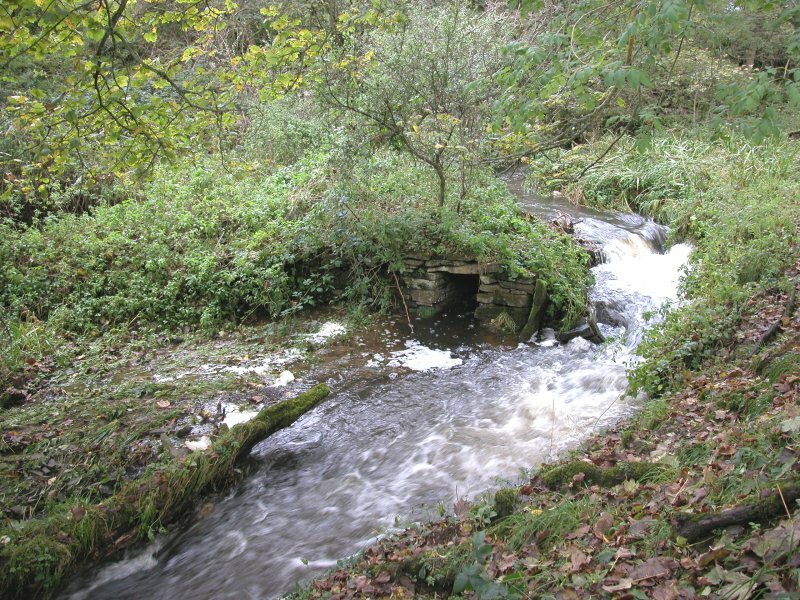 Within this area many of the watercourses are bridged by concrete tank crossing points, generally in groups of three. 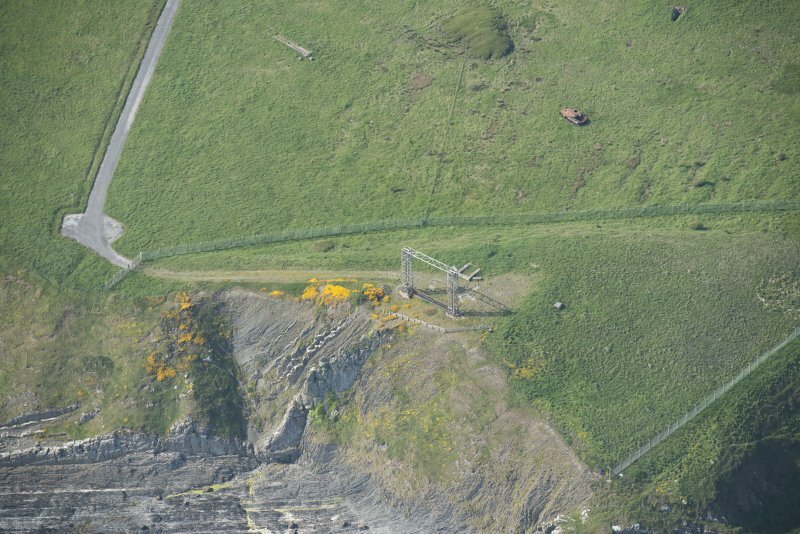 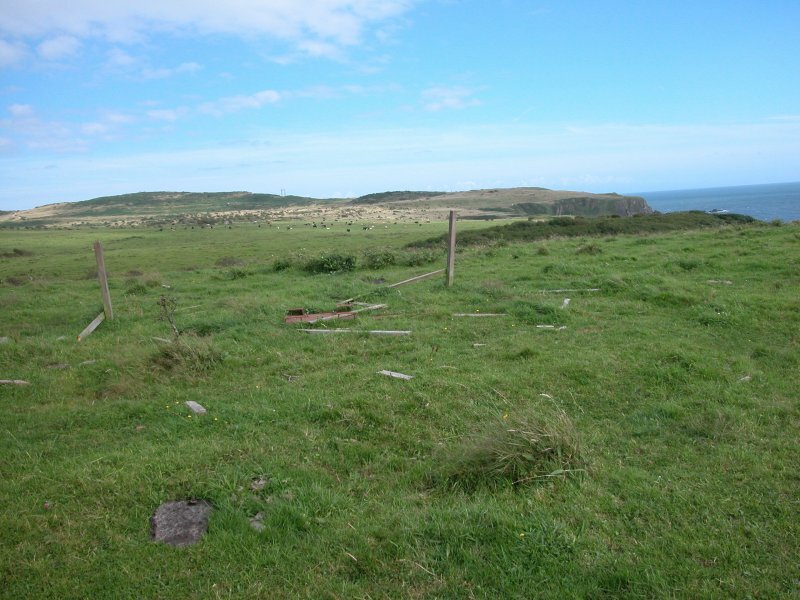 Also within this area there are rows of narrow concrete posts, usually arranged in lines of up to 8 posts that may range in height from 0.5m to about 2m. 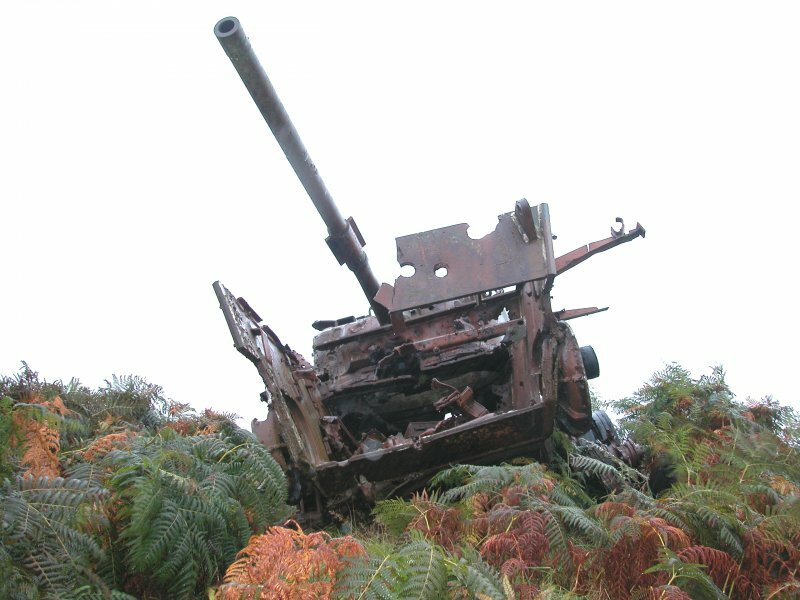 These have may been some form of target or a range finding mechanism. 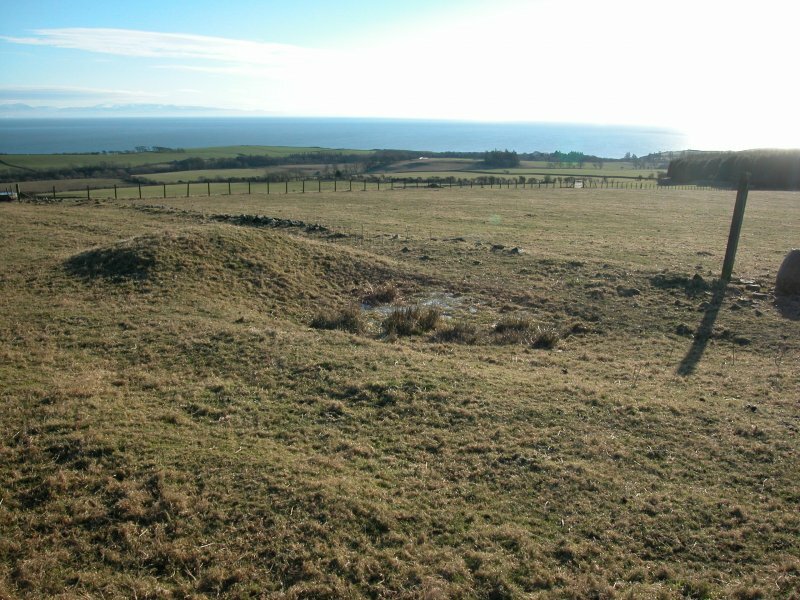 In the western half of the range use focused on a series of fixed firing stances ranged along the northern fringe of the range. 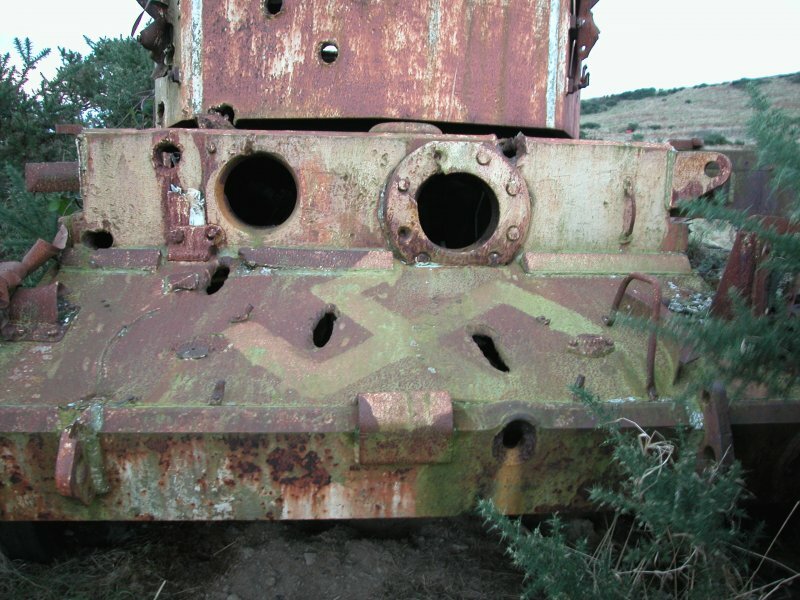 These are serviced by the tank road with also connected to three trapezoidal tank tracks that could be used to practice firing from a mobile vehicle. 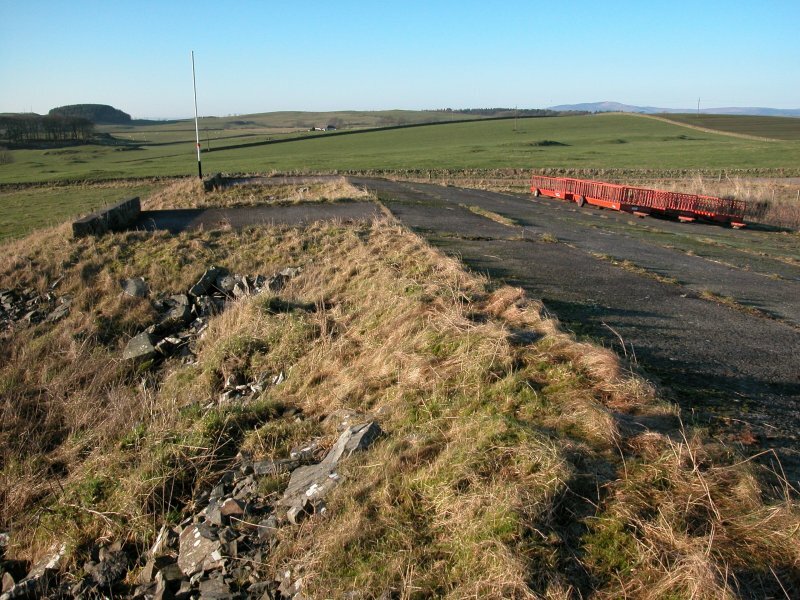 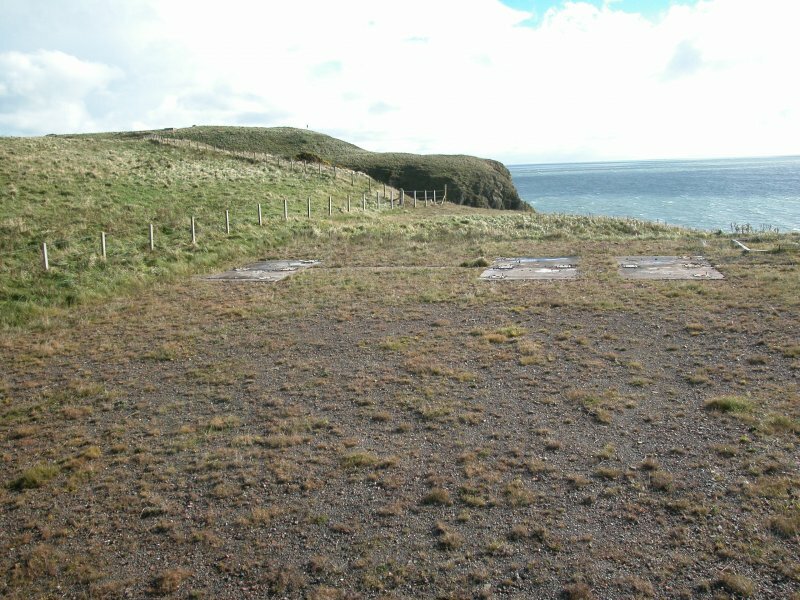 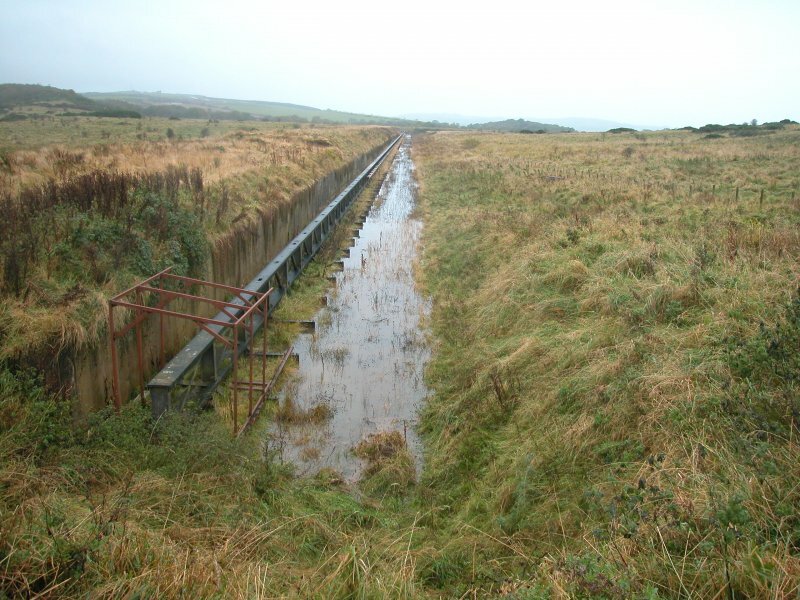 The targets are disposed on the terrace above the sea cliffs and comprise four tracked targets running on a narrow gauge rail and powered by plant in bunkers are either end of the track. 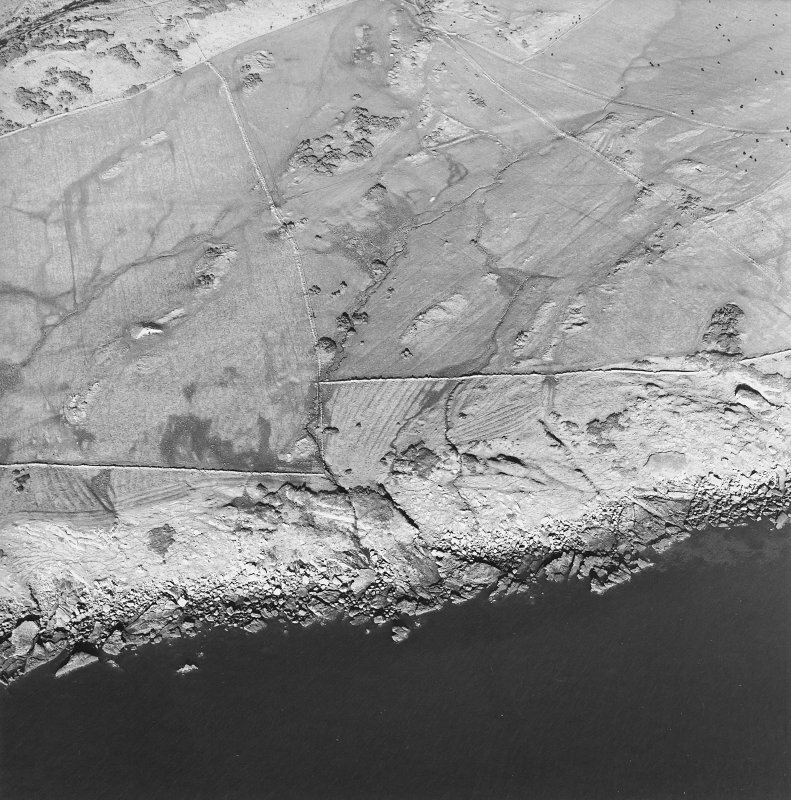 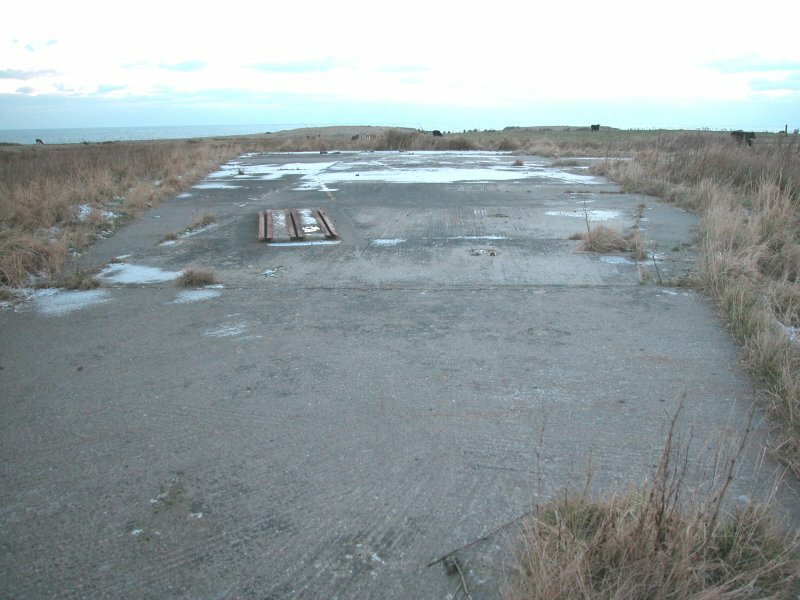 The scoring of the ground behind these targets by shell impacts can be seen on the aerial photographs, though none of it appears to be fresh in 1946. 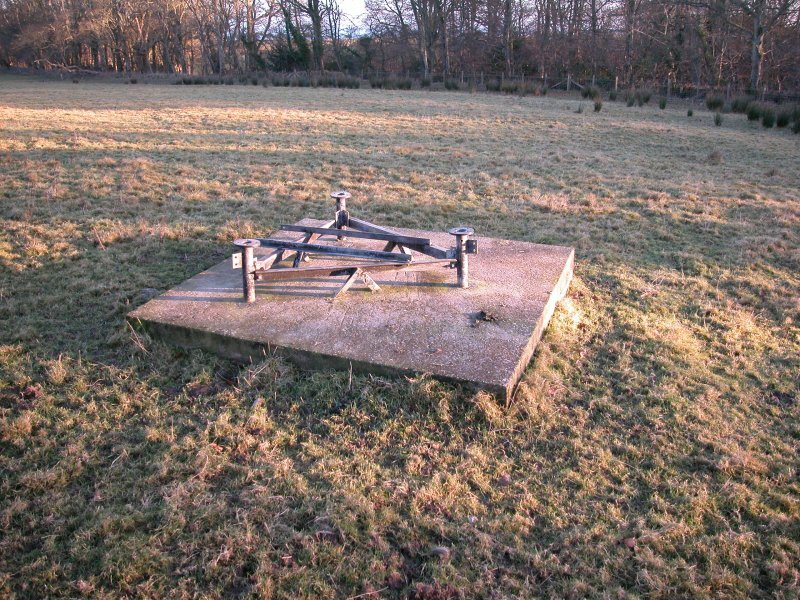 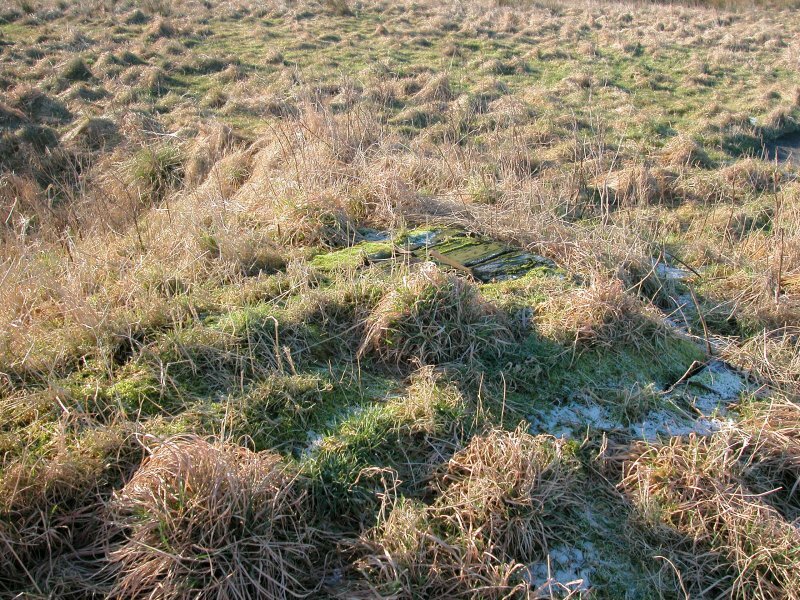 Smaller targets, presumably for small calibre weapons, comprise three pairs of bunkers housing pop-up iron frames across which canvas or other material may have been stretched. 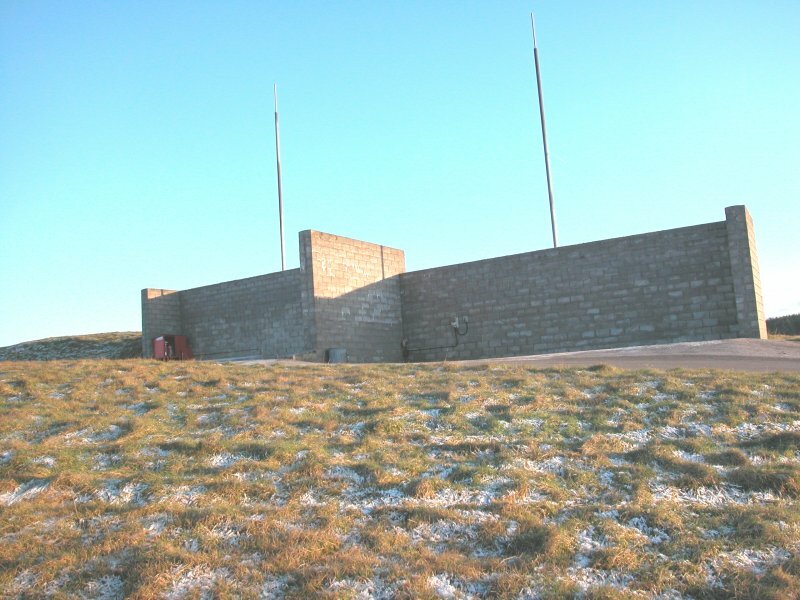 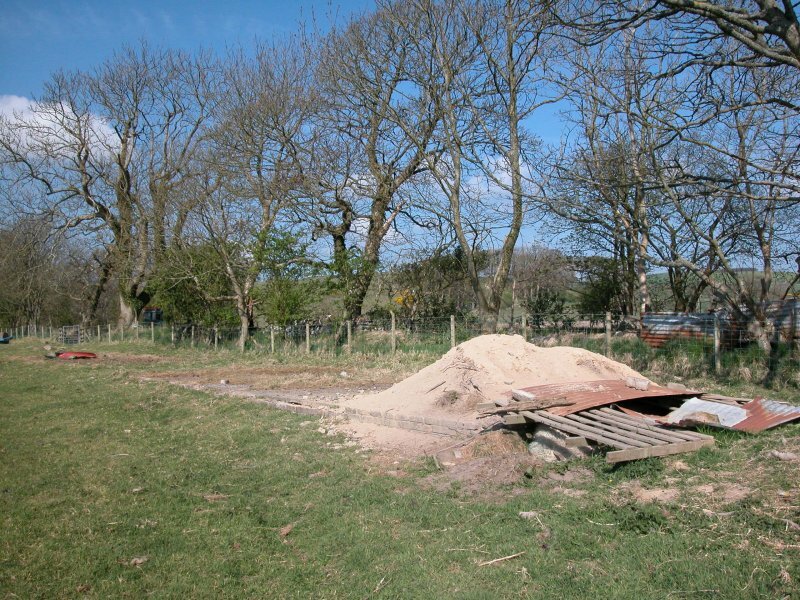 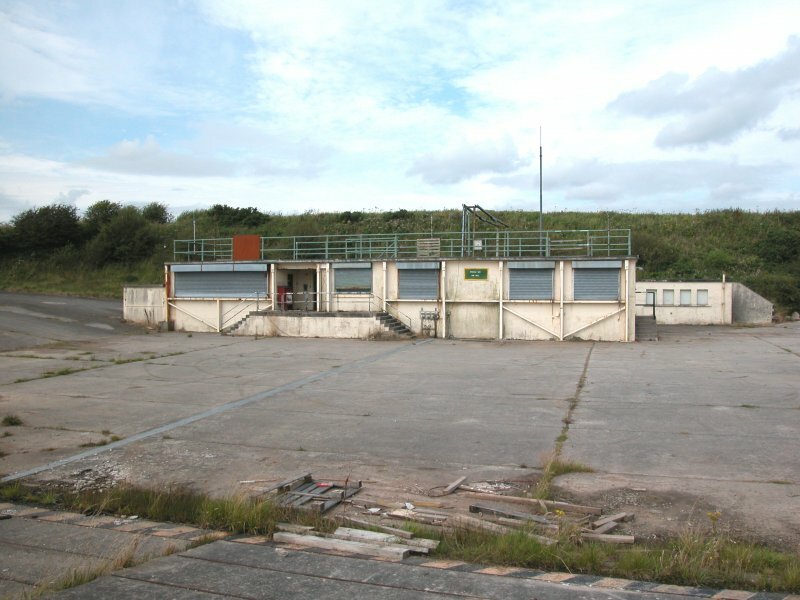 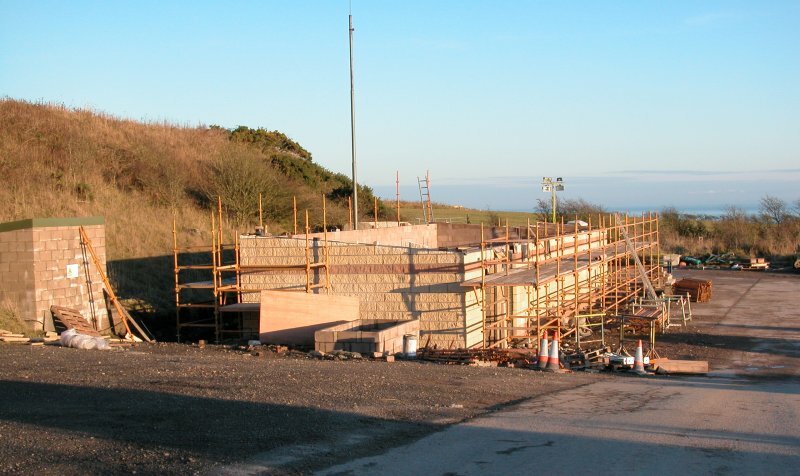 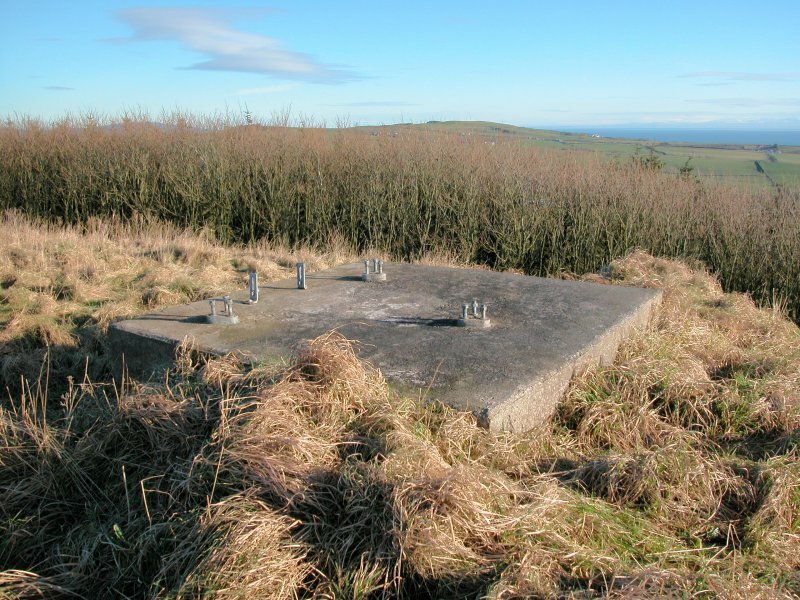 The bunkers that are disposed across the impact zone can be divided into those associated with the tracked targets which housed plant and mechanisms to drive the targets and observation bunkers furnished with small ports and heavy steel doors. 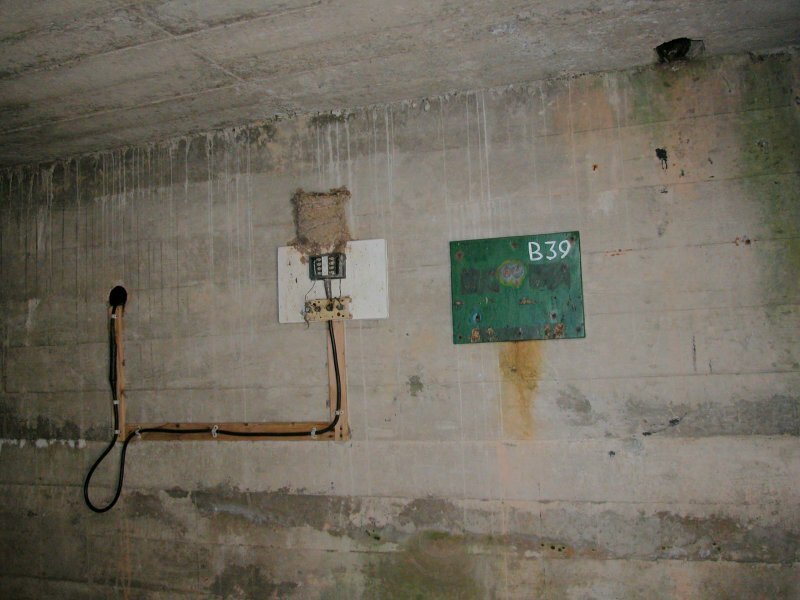 Some of the bunkers associated with the targets may have served specialised functions such as operations control and ammunition storage. 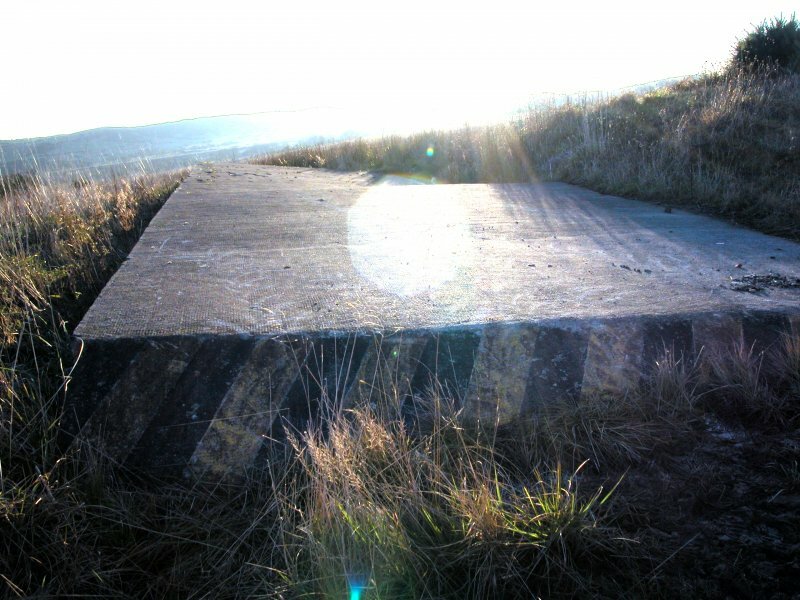 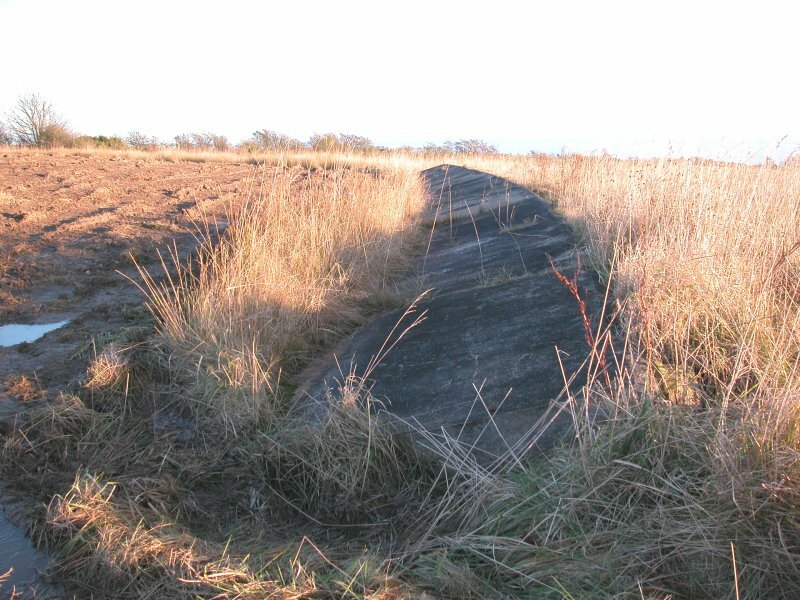 Further developments of the range in the 1960s and 1970s saw the installation of additional tracked targets including the massive track on the N flank of Wall Hill. 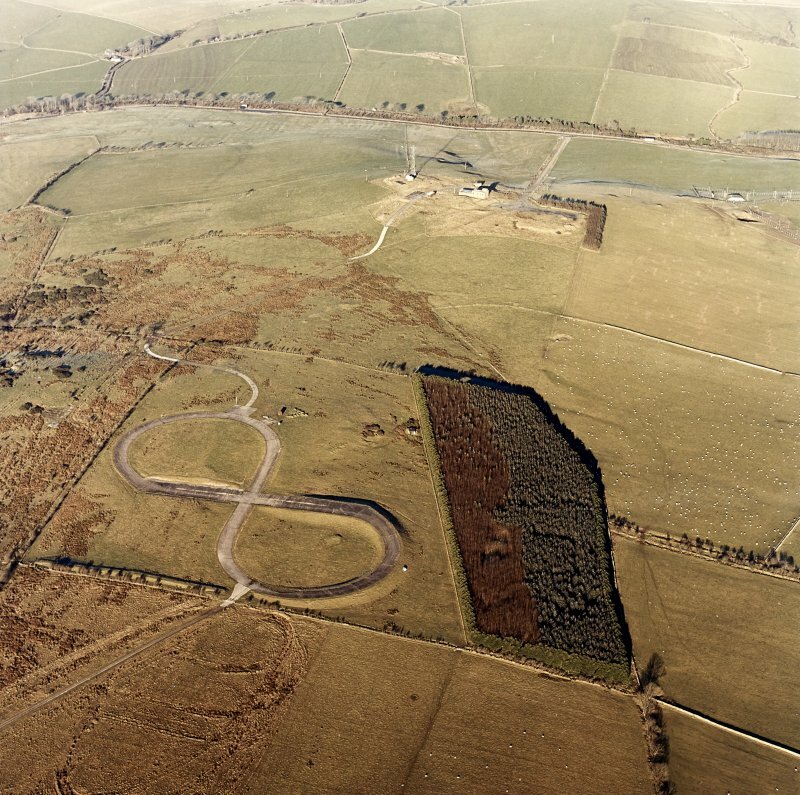 By 1962 aerial photographs (RAF 58/4957, 22 February 1962) suggest that the use of the eastern half of the range for extensive mechanized vehicle manoeuvers may have ceased. 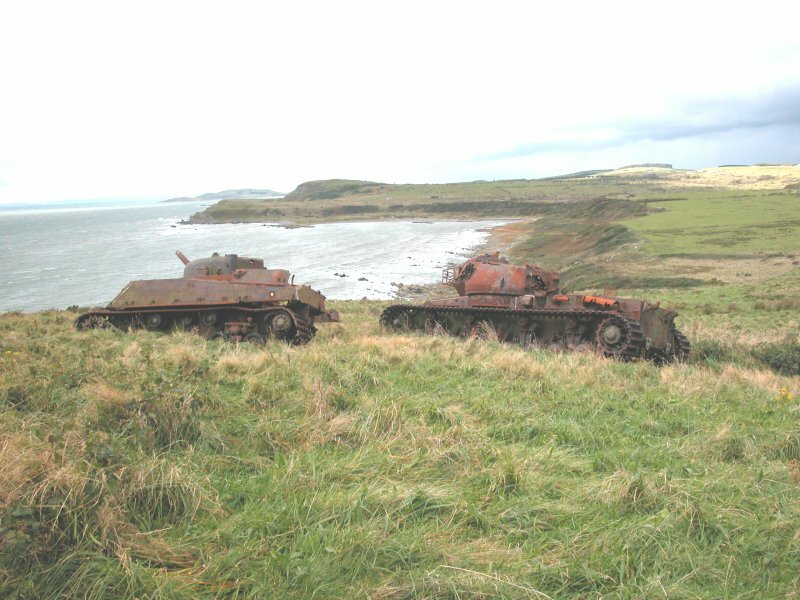 From 1975 the hulks of tanks disposed across the southern and central part of the range, but predominately in the east, provided additional targets. 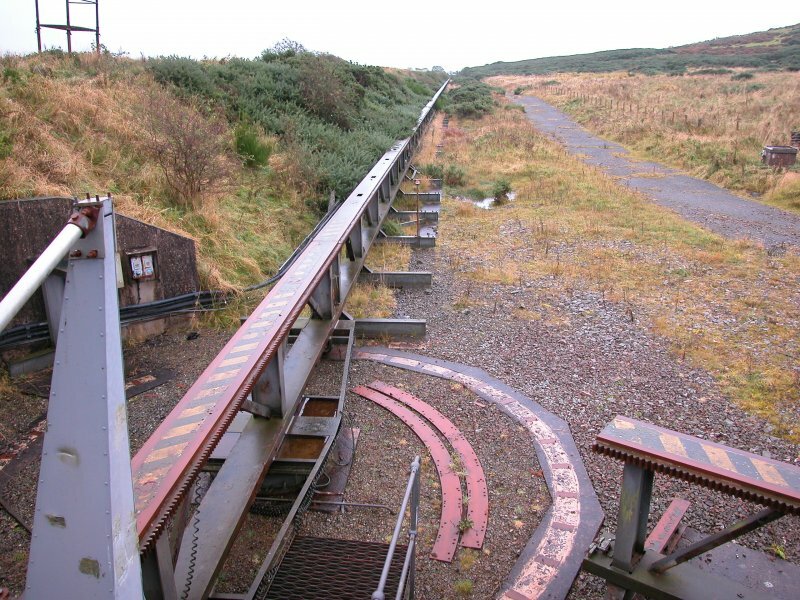 Gantry targets in groups of up to three and in a variety of sizes are also constructed during the 1970s and later; indeed some remain in use. 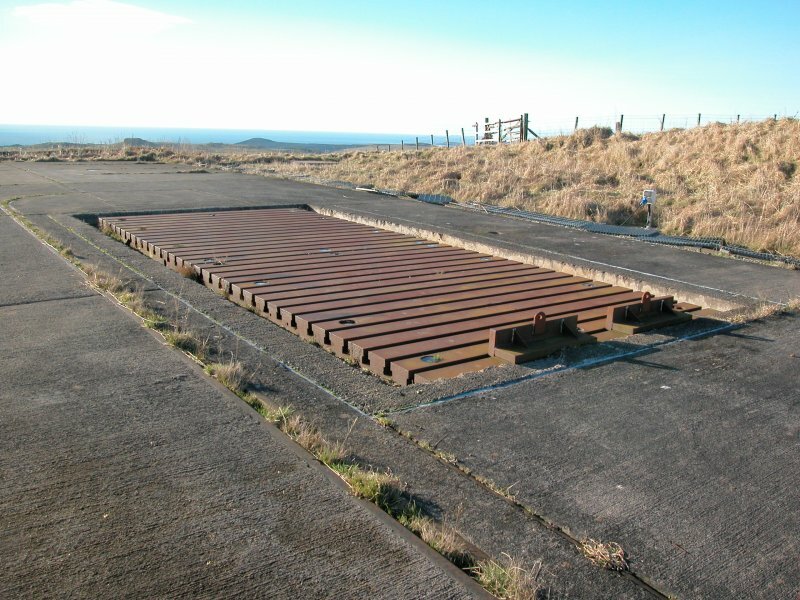 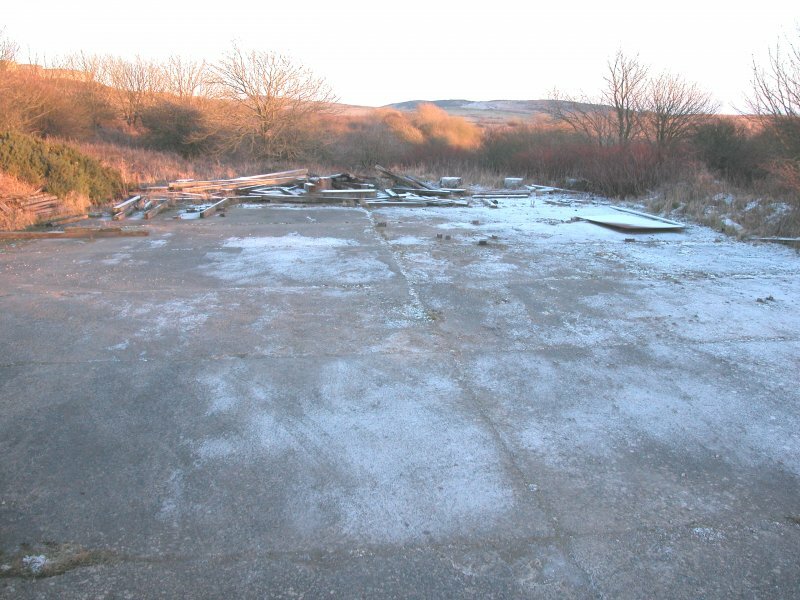 During the 1980s the figure-of-eight tank track on High Barcheskie was built and additional firing ramps, including ones with a variety of angles of rest are installed around the Central Firing Point (NX 731 456). 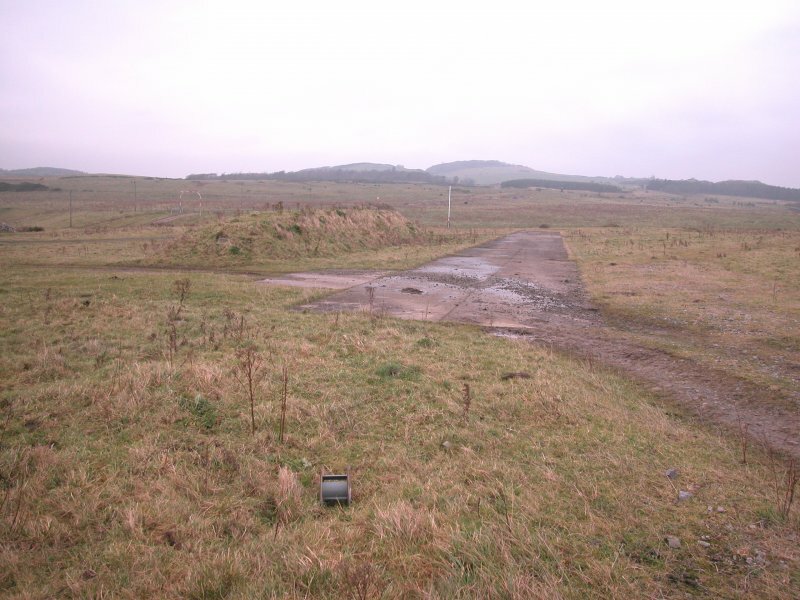 Testing and development facilities for the Milan Missile are built on Silver Hill and there was attack of armour testing and deflagration of 500lb bombs in the Gypsy Point area; mine plough testing was also conducted in this area. 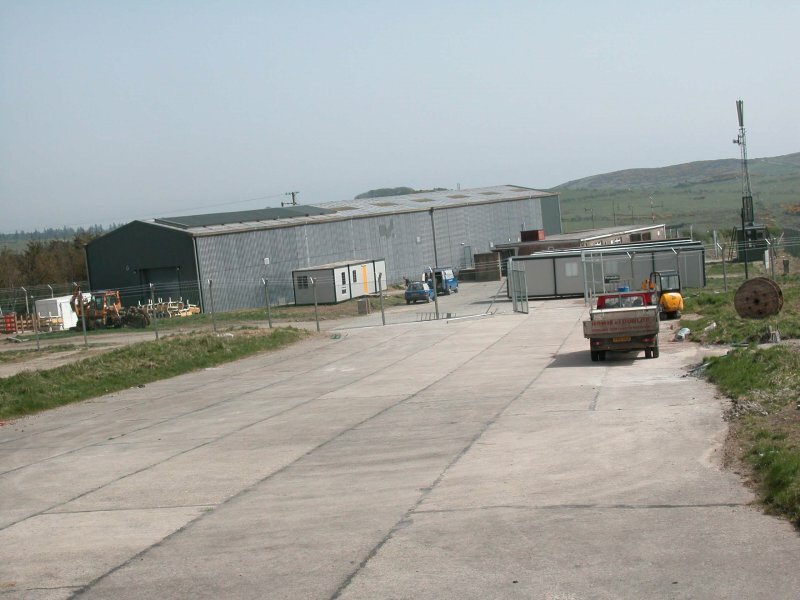 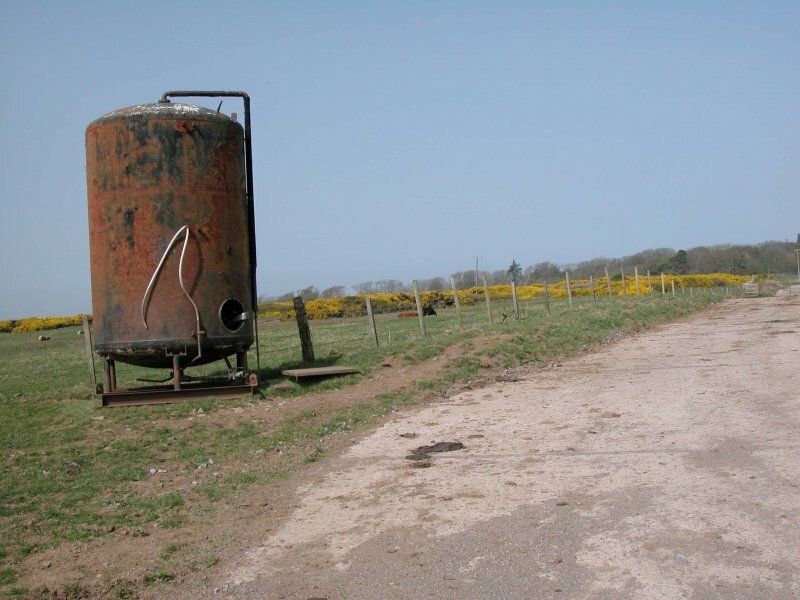 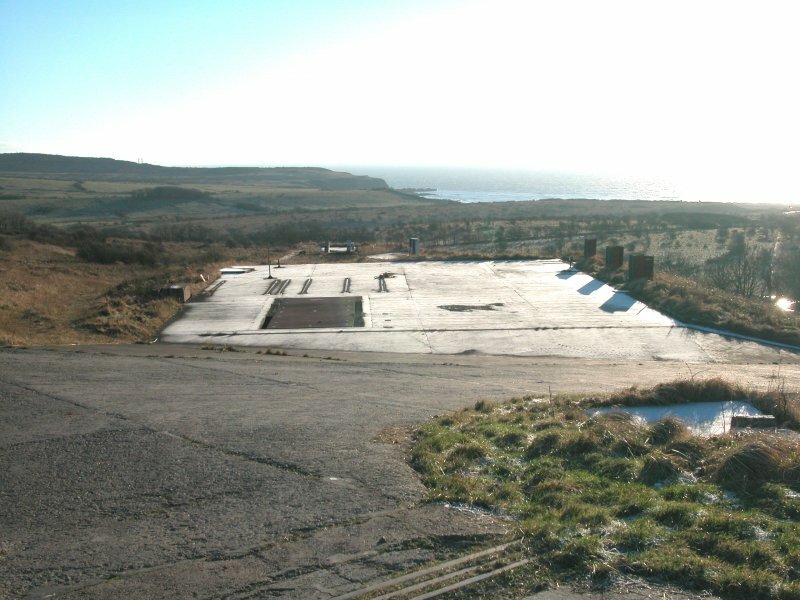 The testing Depleted Uranium shells saw further development work including the construction or development of the firing complexes on Doon Hill, at Balig and at Silver Hill Low.